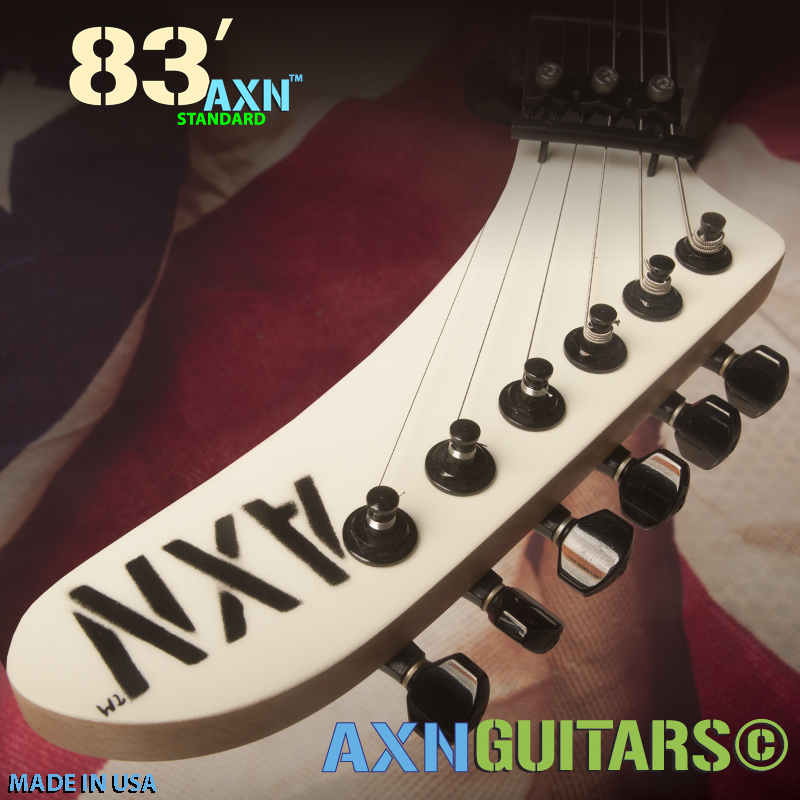 What do we stand for and what is an AXN™ Guitar About? 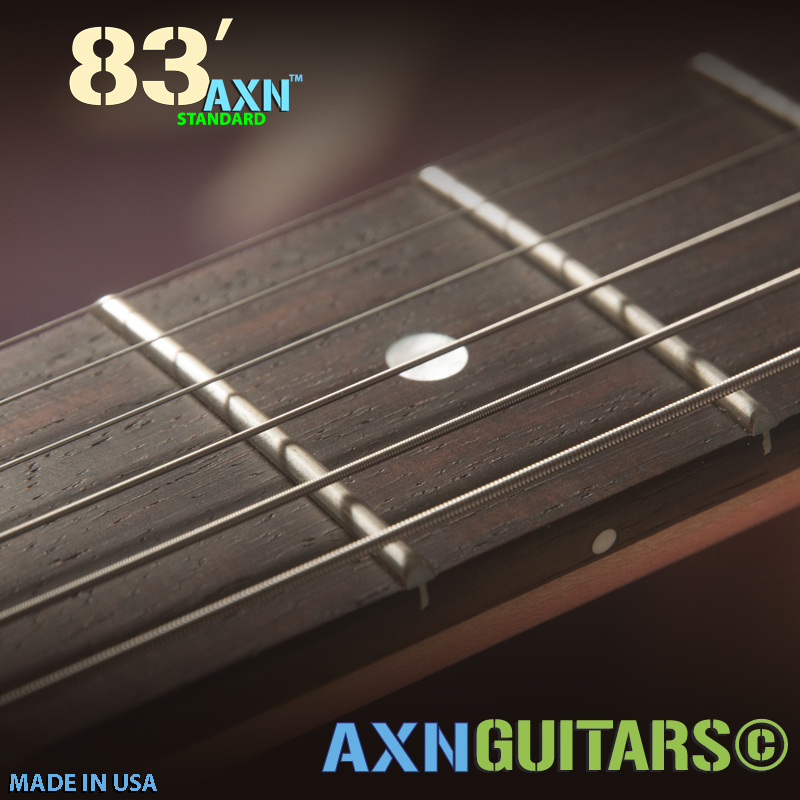 Today we have shown parts of our daily routine in this 42 second AXN™ Guitars Video Short. 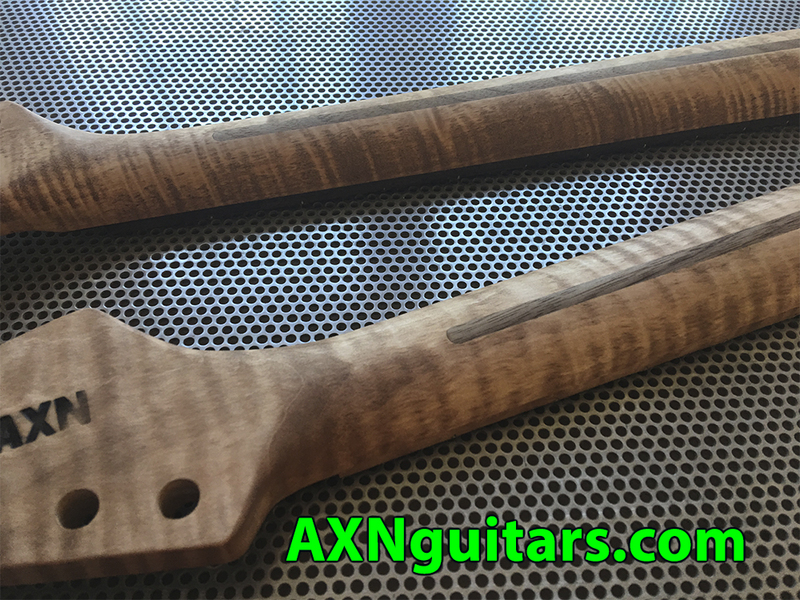 For us sorting through raw guitar tone-woods is exciting. 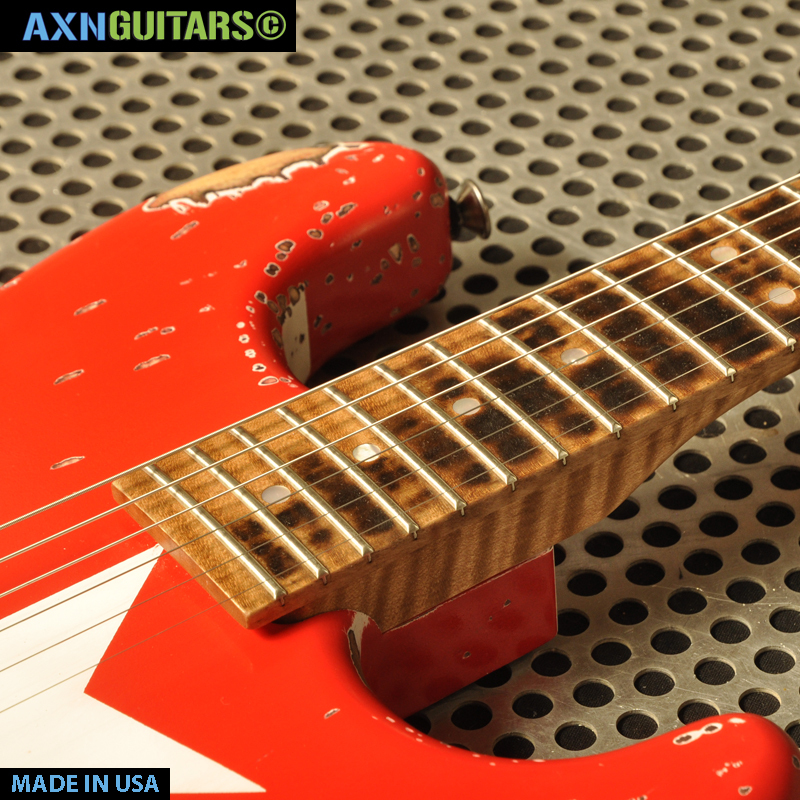 Picking maple wood for the guitar in this video is an excellent example of some good times! 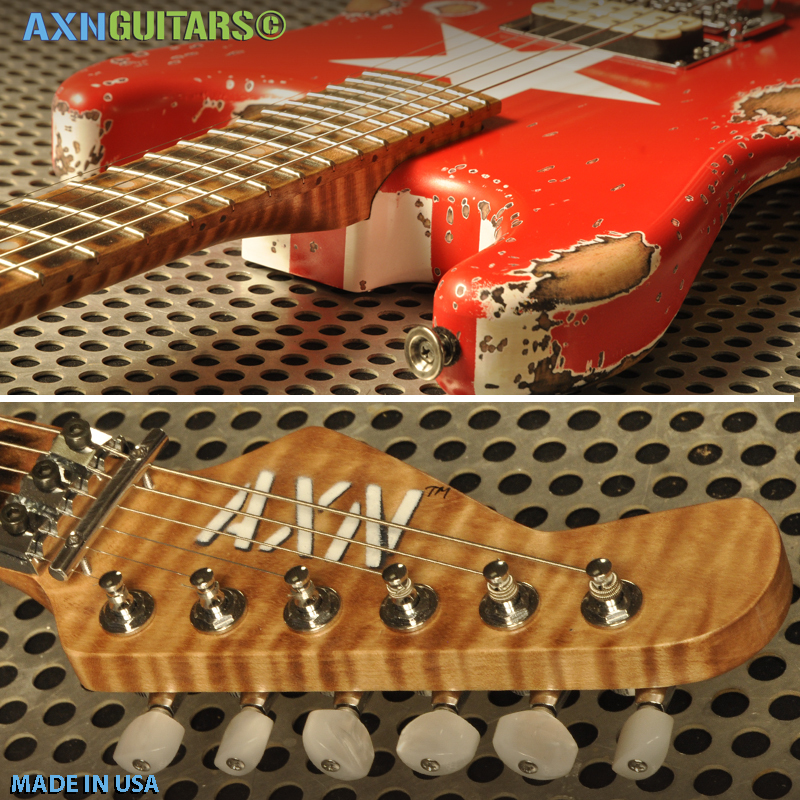 The AXN™ Model2 guitar in the above video was manufactured from prime woods. 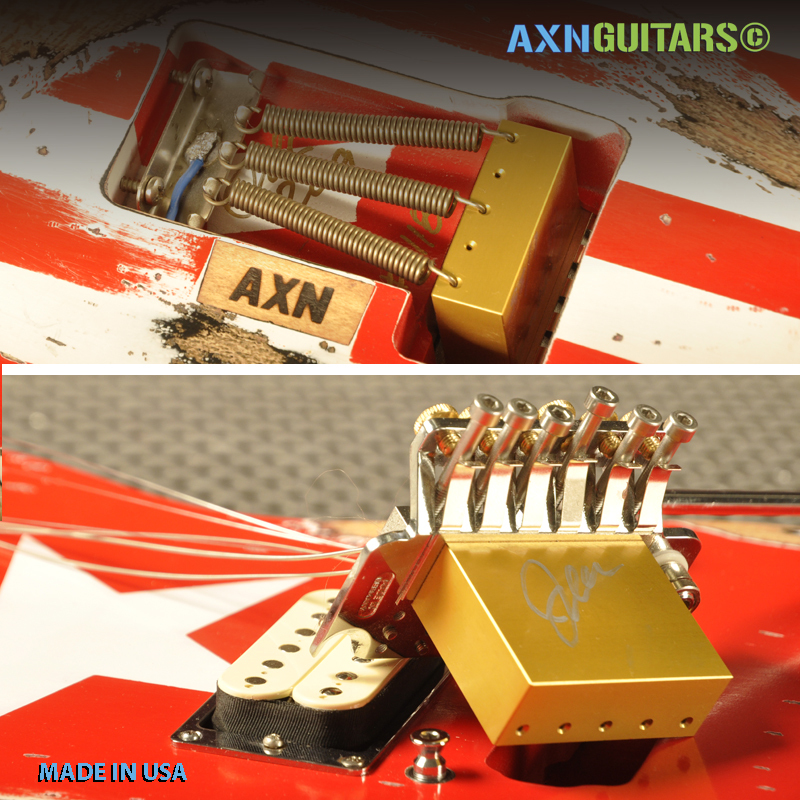 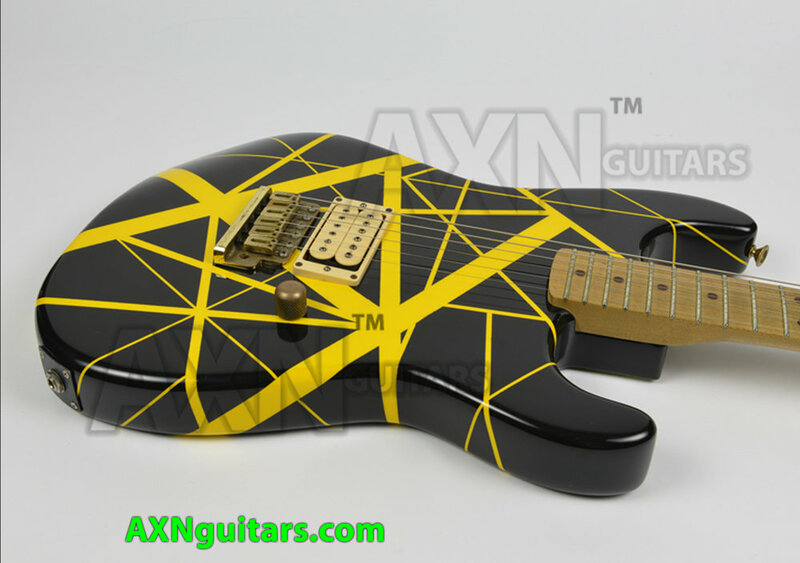 Every AXN™ surpasses by far the quality of any production line guitar! 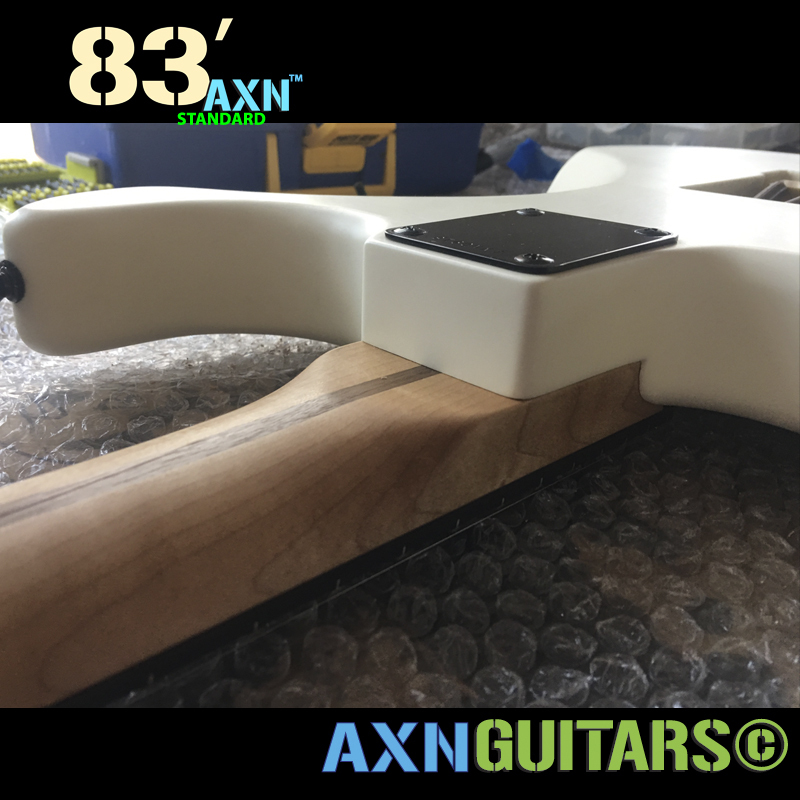 If you give a closer look you can see that we made this AXN™ guitar body from 2 pieces of center-joined white maple. 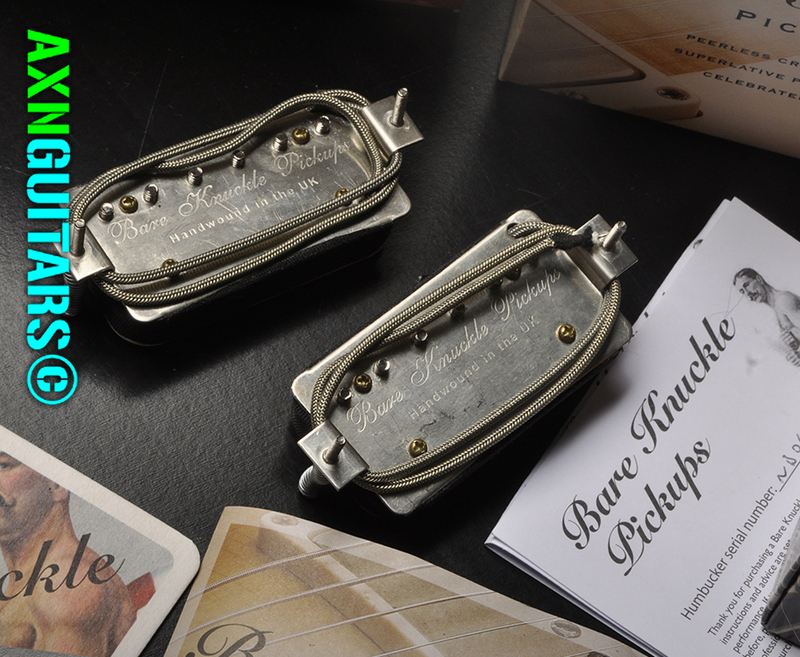 A design that creates robust tone. 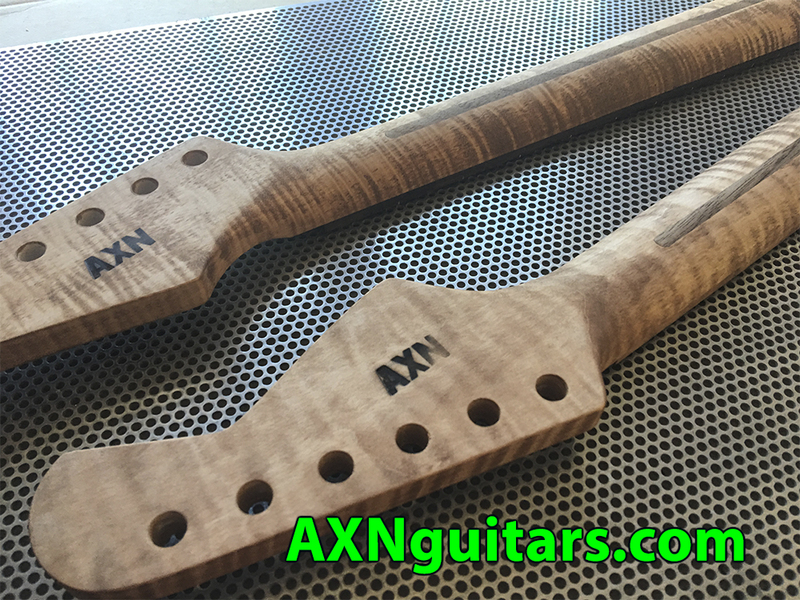 The AXN™ guitar neck in this video we manufactured from extremely flamed or tiger striped maple wood. 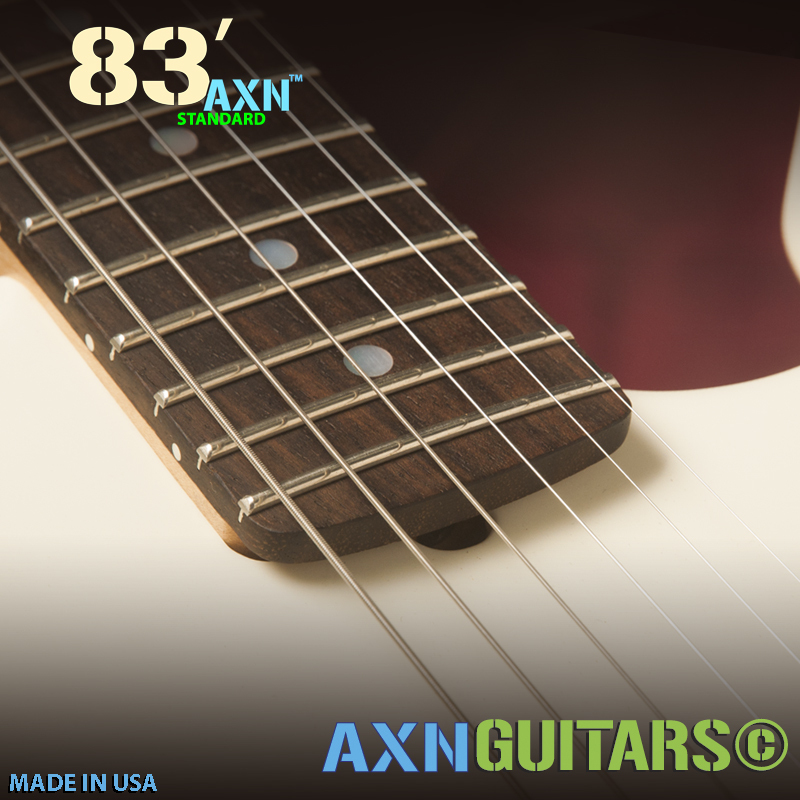 The white mother of pearl fret markers with our unique AXN™ fretboard relic-ing and perfect fretwork creates a true work of art. 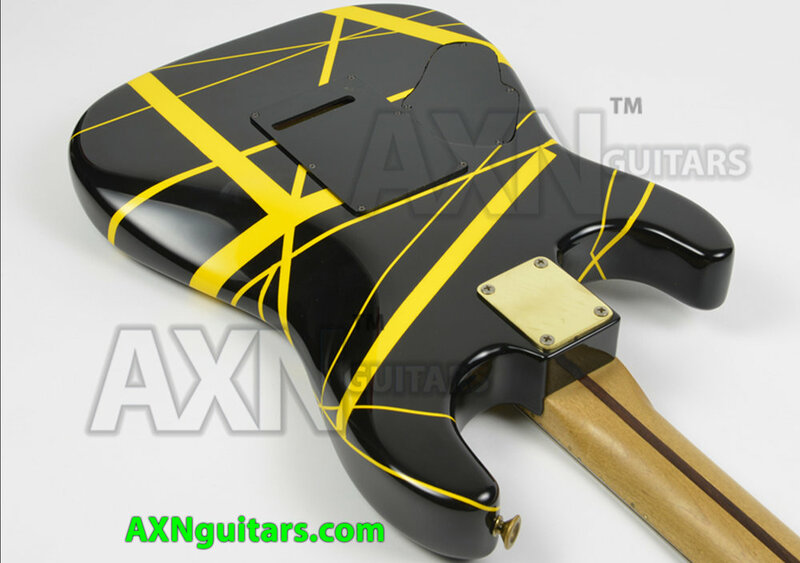 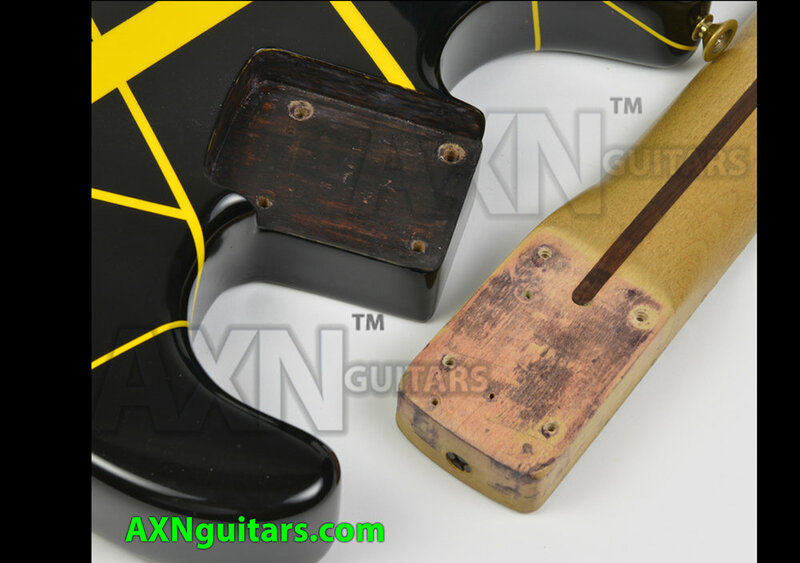 After finishing this new AXN™ becomes an aged guitar. 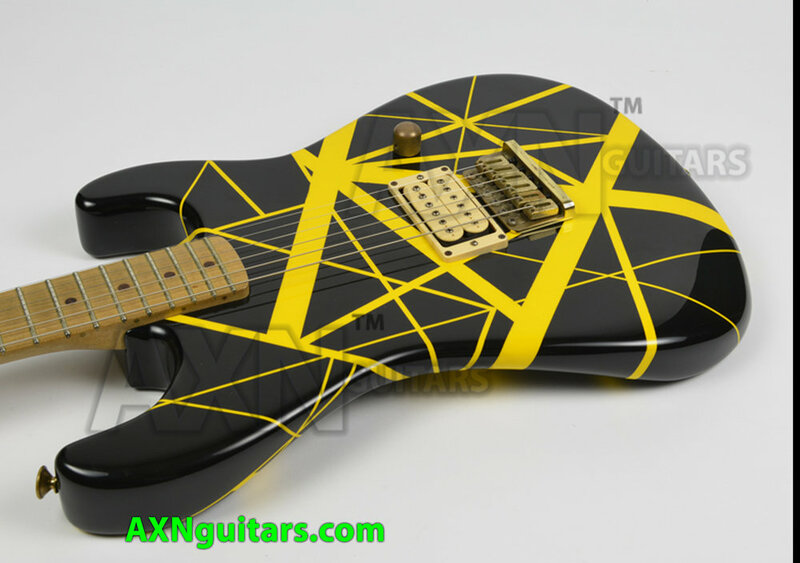 The video footage demonstrates the transformation from new-to-aged. 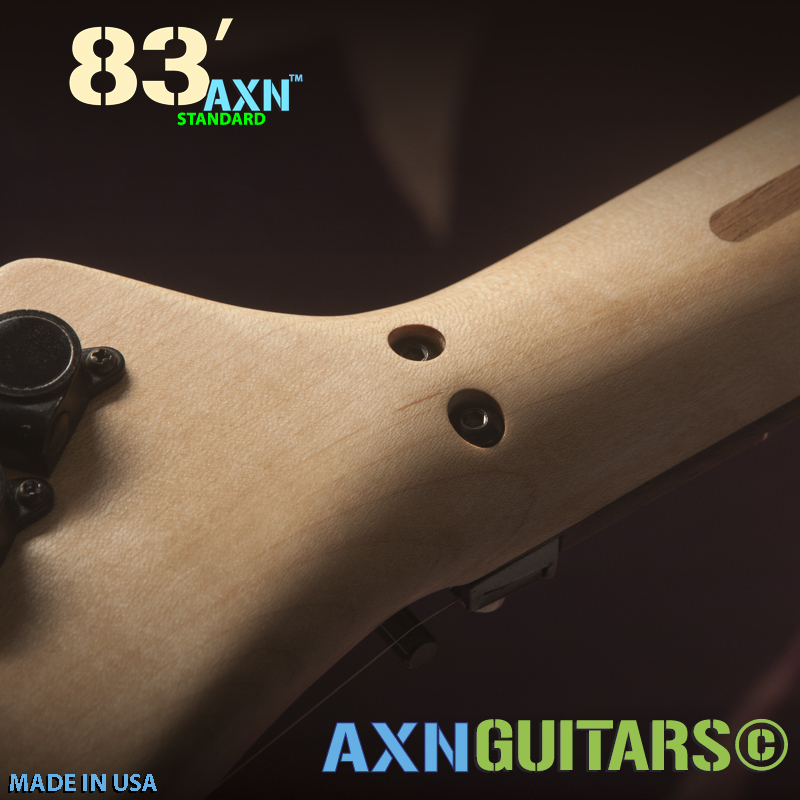 At the end of this video is our AXN™ Guitar in all its glory. 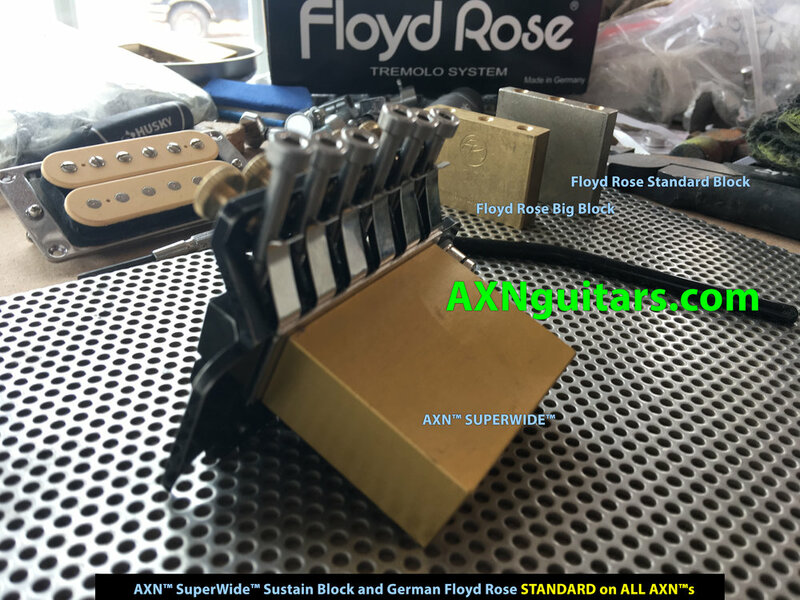 With our proprietary AXN™ SuperWide™ Sustain Block and a new German made Tremolo - our AXN™ Guitars deliver the Ultimate Floyd Rose experience. 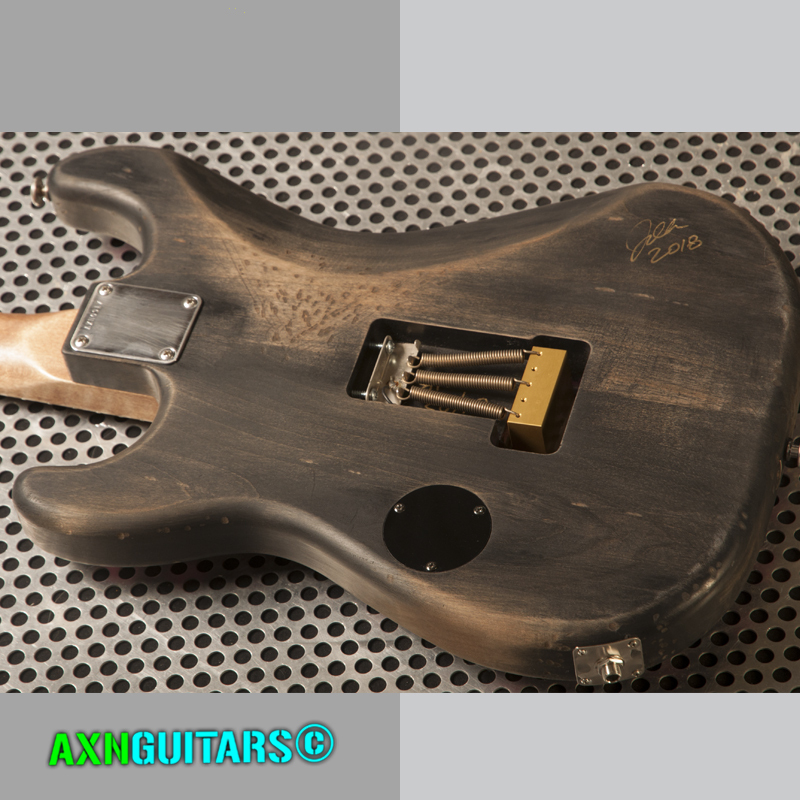 The result is a tone-monster. 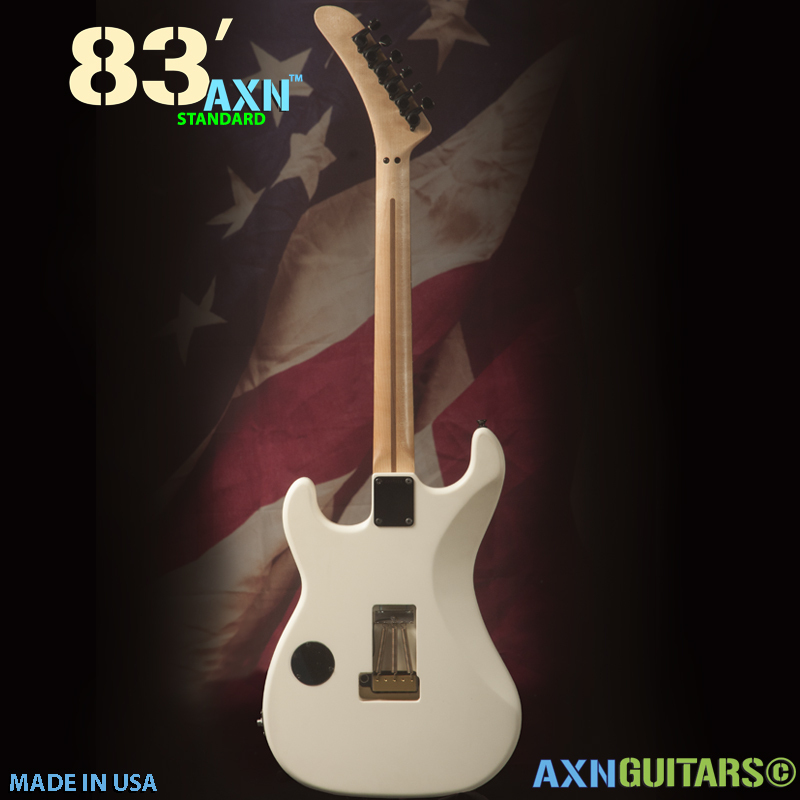 This guitar produces a huge bottom end with articulate highs and excellent mid range attack. 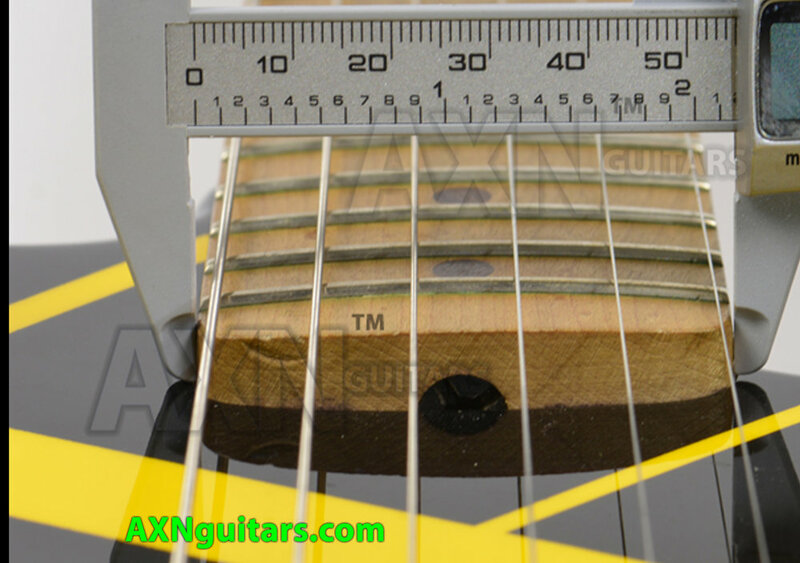 With a hard wood like white maple the “snappy-ness” of the string is such that this guitar achieves near-endless sustain. 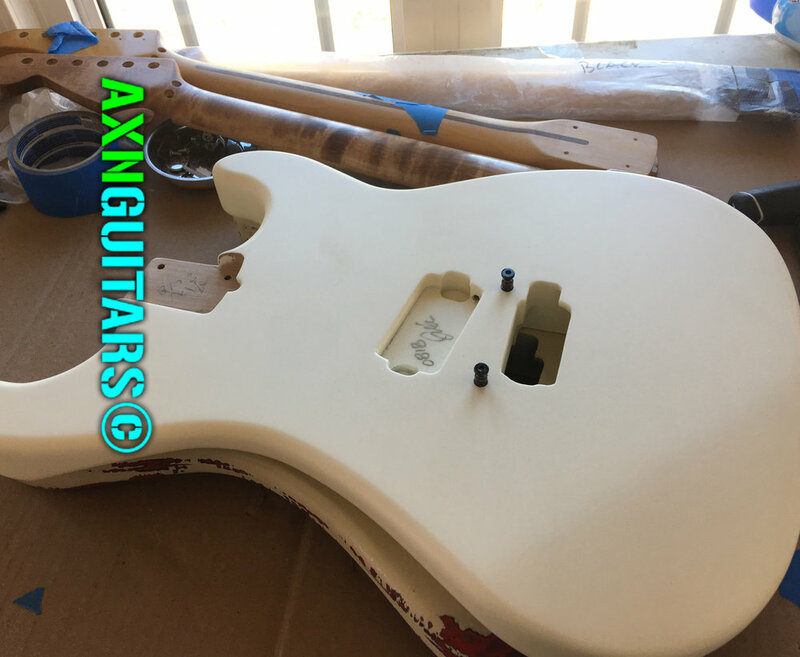 Since our guitars don’t have traditional tone-killing clear coat every note sings on and on forever. 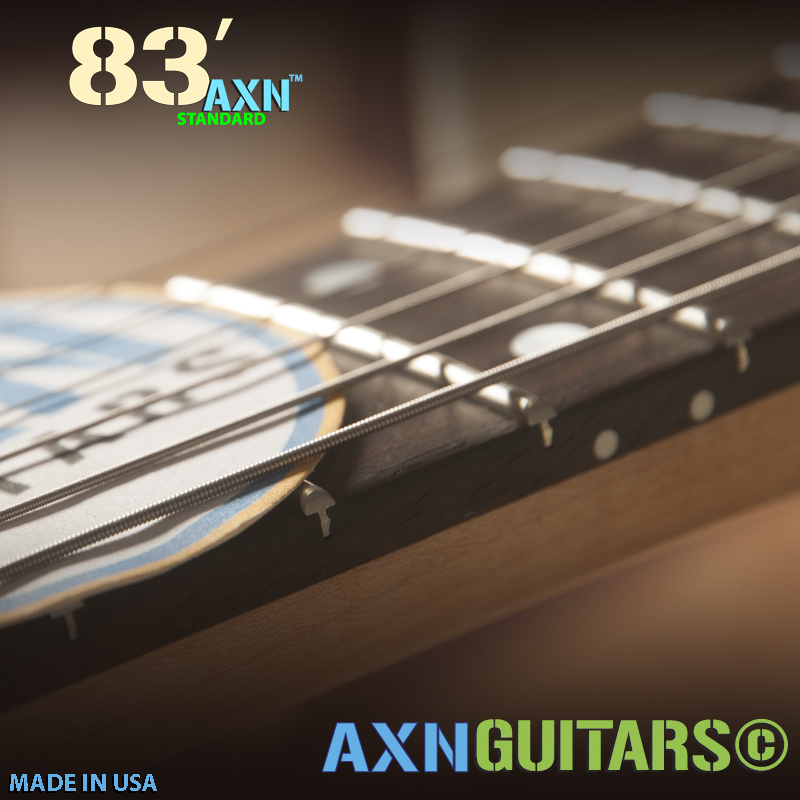 With equal parts inspiration, perspiration and preparation. 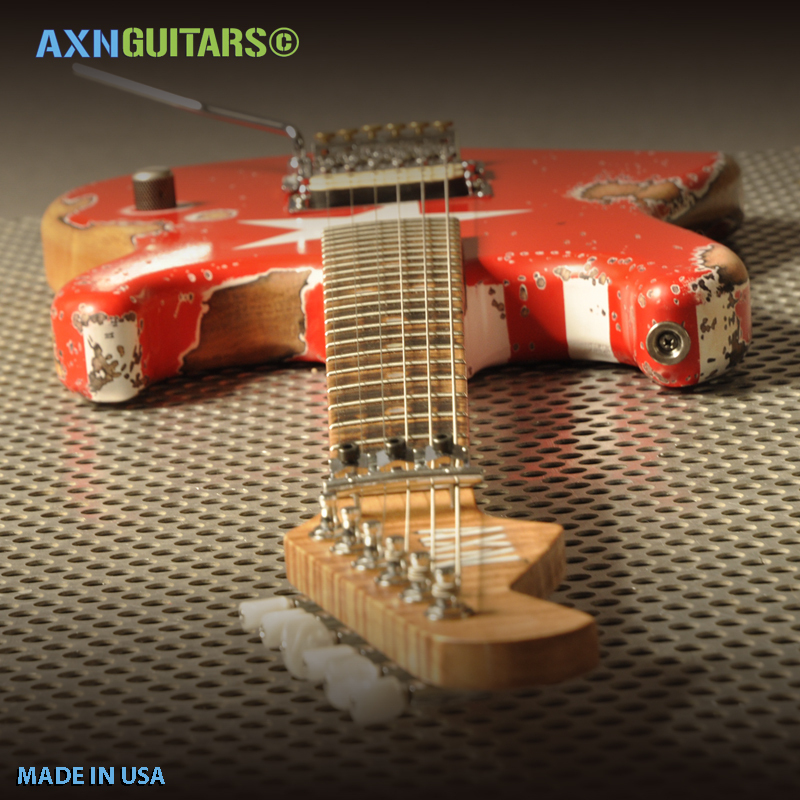 Our AXN™ guitars are hand made works of art. 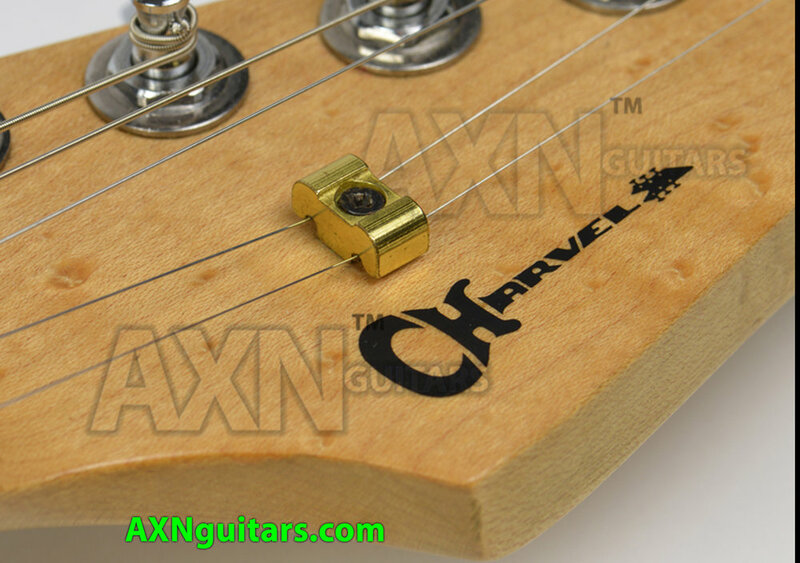 They have a level of accuracy and inspirational quality that is far beyond the standard. 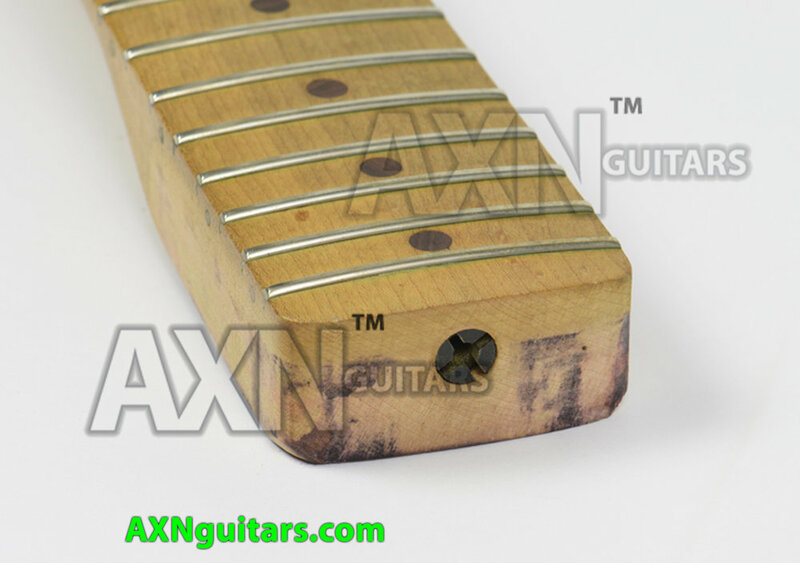 Every piece of wood is the best tone-wood available. 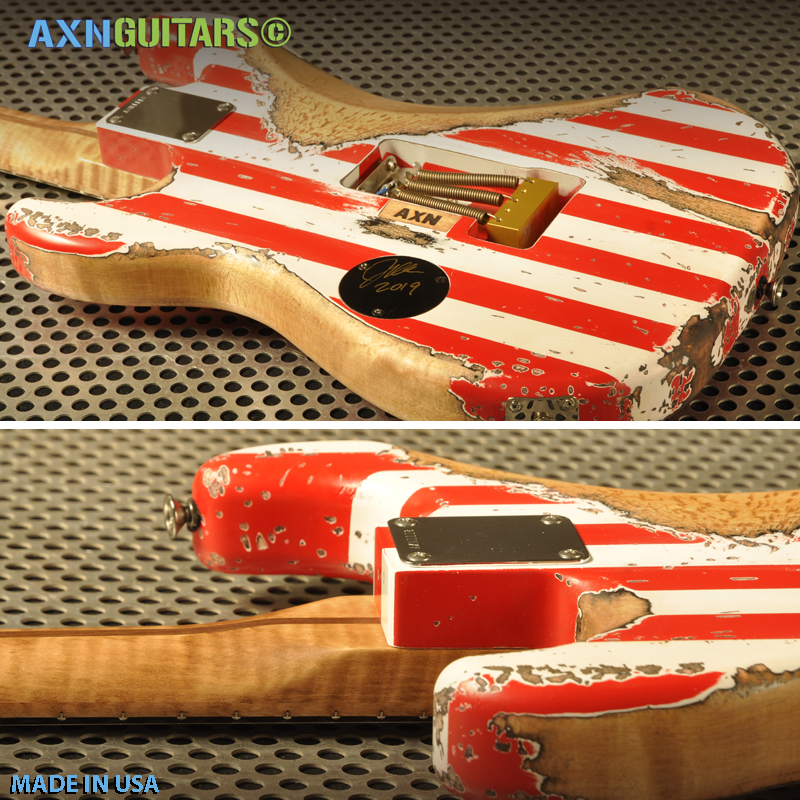 We get our hands dirty here in the USA and manufacture these guitar the old school way! 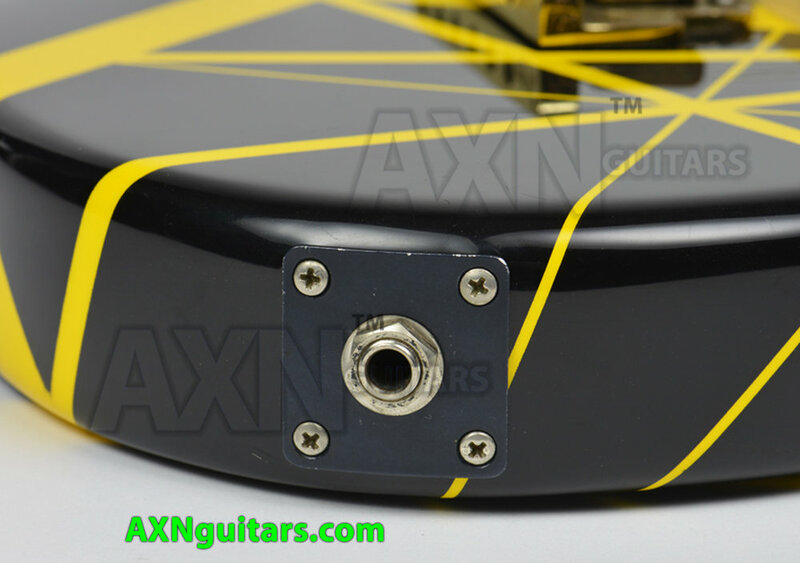 Every ding, every dent, scratch and imperfection is positioned precisely. 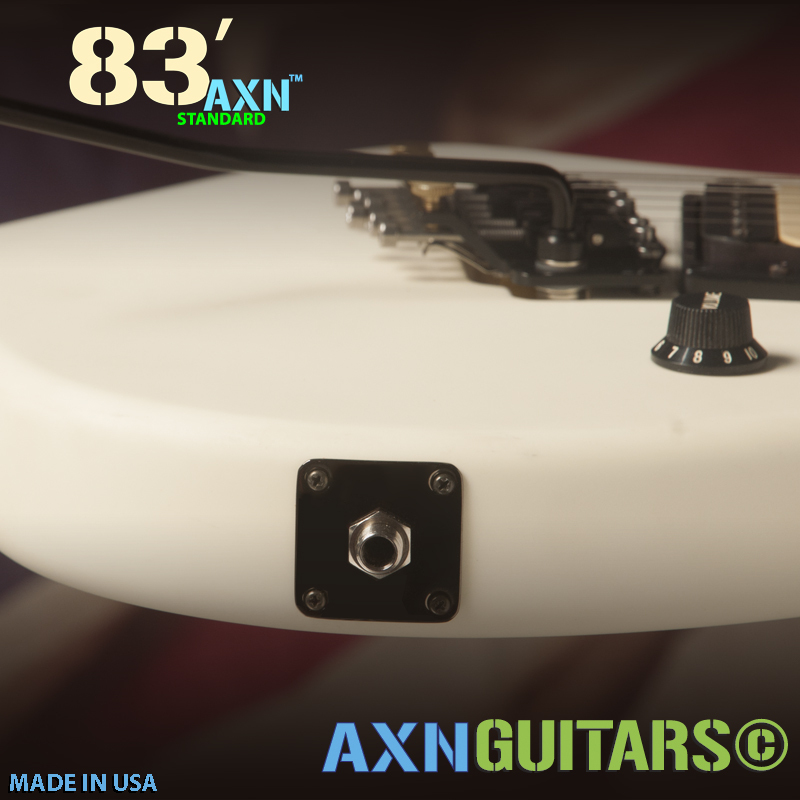 At AXN™ Guitars we believe that for hard rock music the single humbucker guitar can be an important guitar to have in your arsenal. 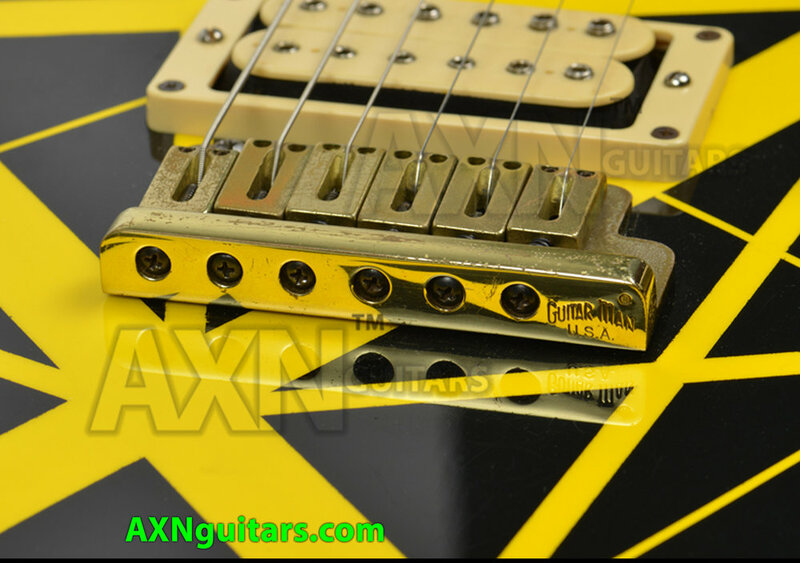 As a matter of fact we believe that a single humbucker guitar is the ONLY guitar you need on stage if you play hard rock. 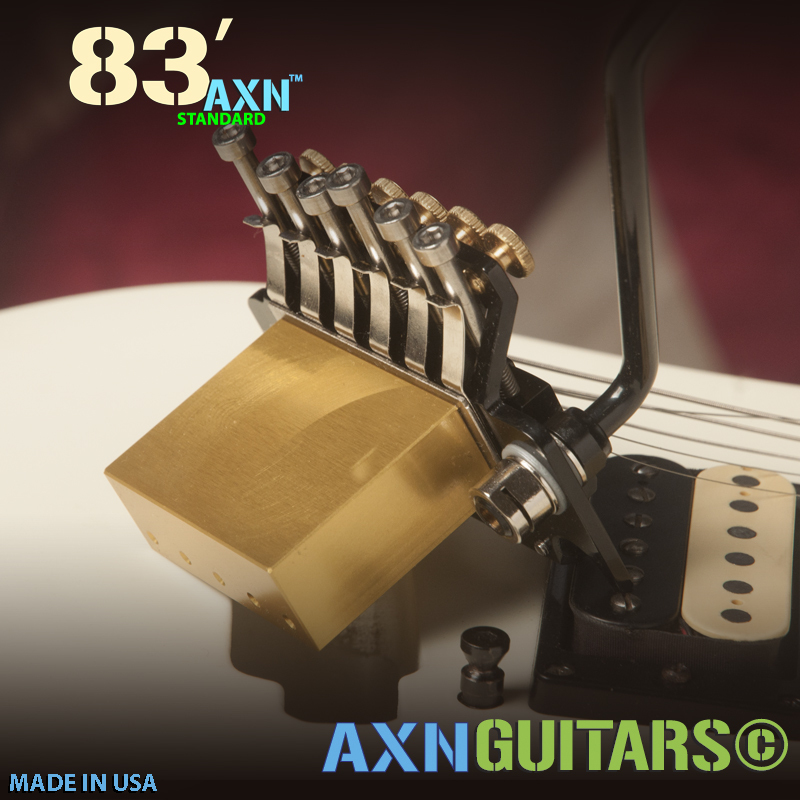 After decades of experimenting, testing R&D and live performance trials we have perfected the right formula making that sparkling clean sound and a balls-to-the-wall metal tone achievable. 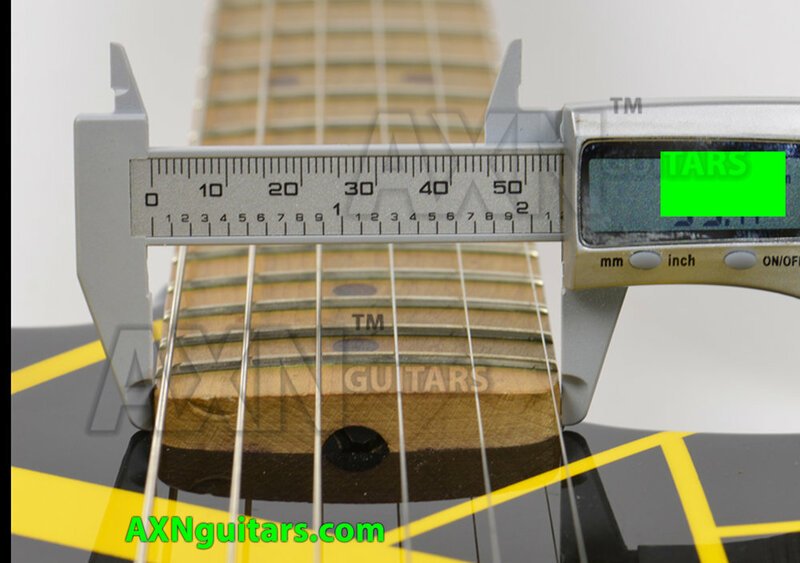 The answer is achieving what we call “headroom” ( A definition of Headroom ). 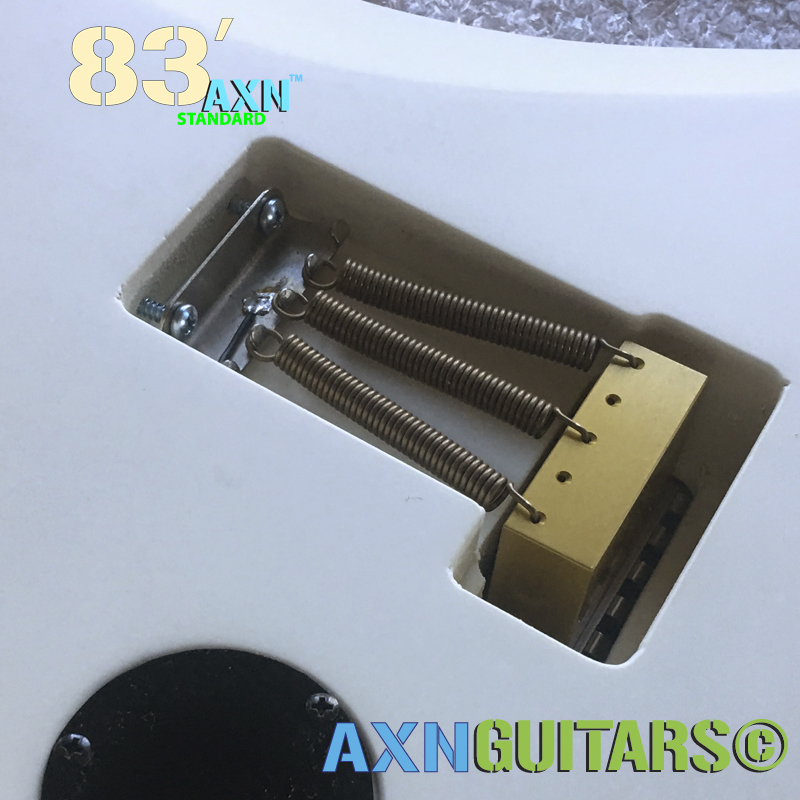 Headroom is achieved from the right combination of quality humbucker pickup, awesome 500k volume pot and a robust wiring system. 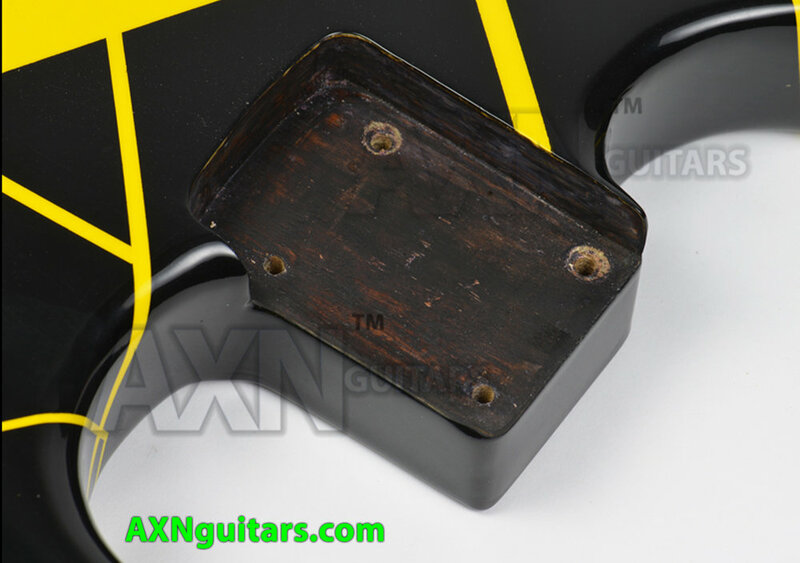 Some things we do to achieve the perfect tone from a single humbucker is very small control cavity and pickup routing to keep precious tone-wood and our AXN™ Electronics Grounding System so your Humbucker sings at maximum. 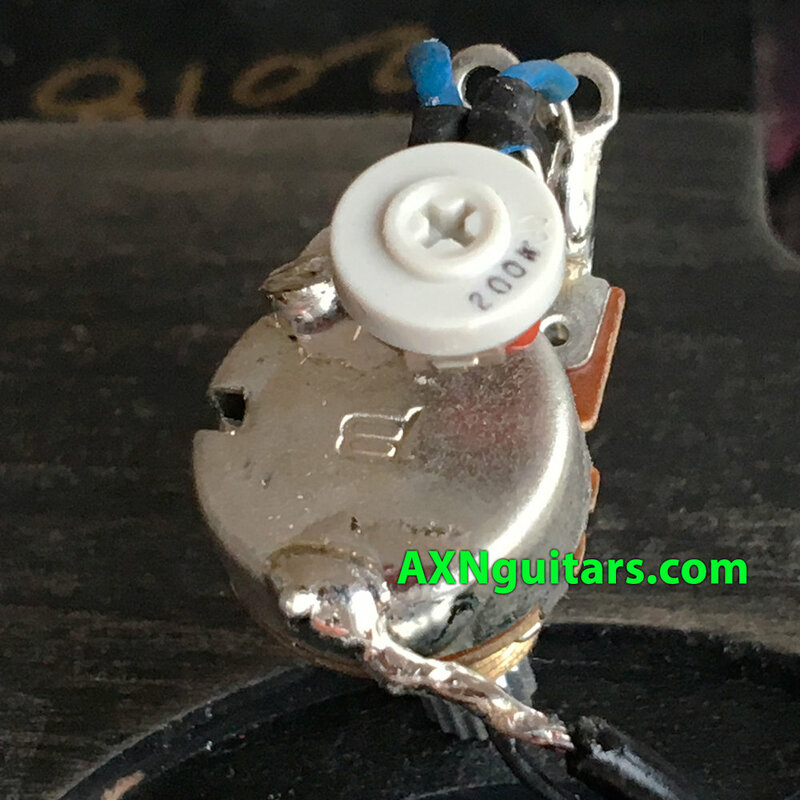 Completely shielded electronics cavities and a 500k Bourns volume pot and now Aerospace Mil Spec M27500 wire/rope throughout the guitar. 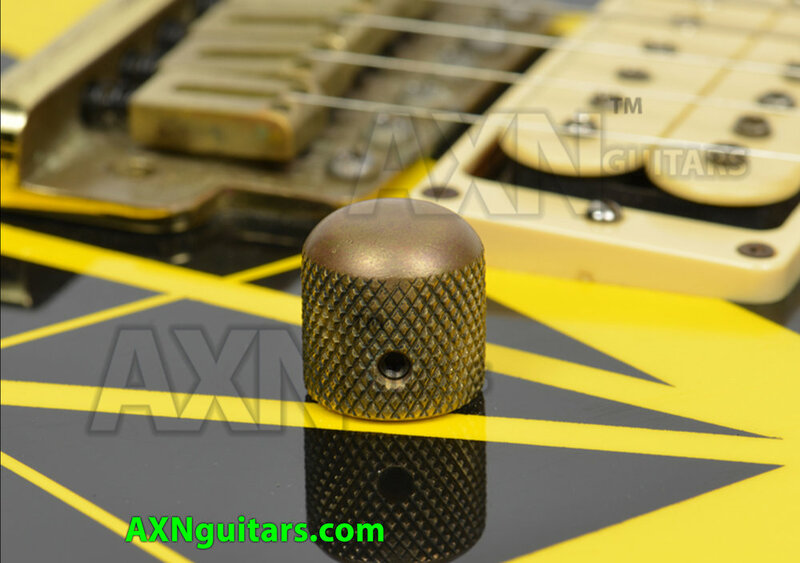 We also utilize a custom sophisticated AXN™ Adjustable Treble Bleed Circuit that keeps just the right amount of mid-tones, treble and cleans when you back off the volume and back-out distortion. 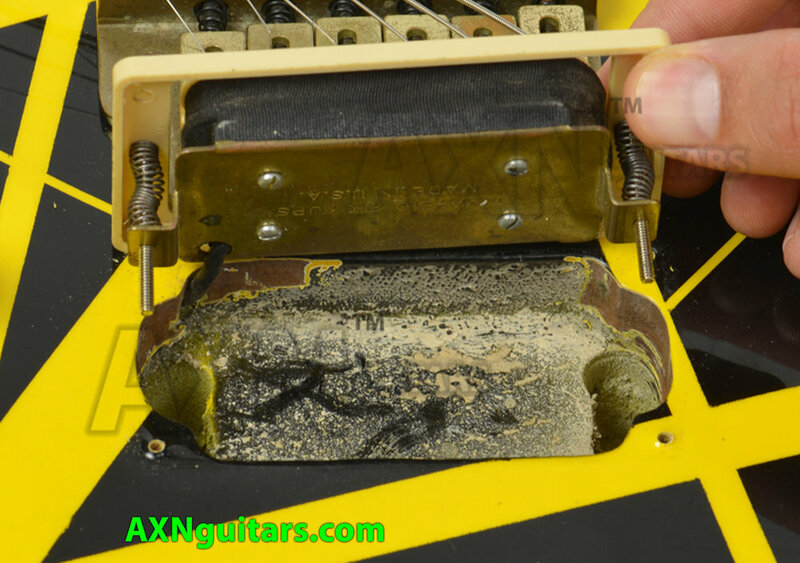 Thats why theres no need for a neck pickup when you perform hard rock-n-roll music. 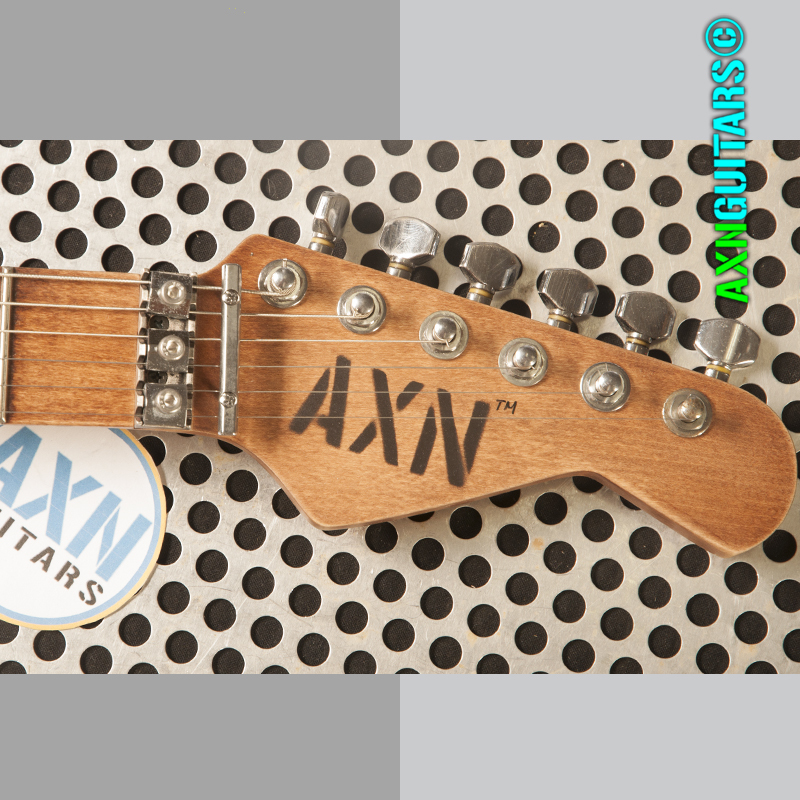 In future articles we will reveal some more subtle details about our AXN™ Guitars and the secrets to a one humbucker only guitar. 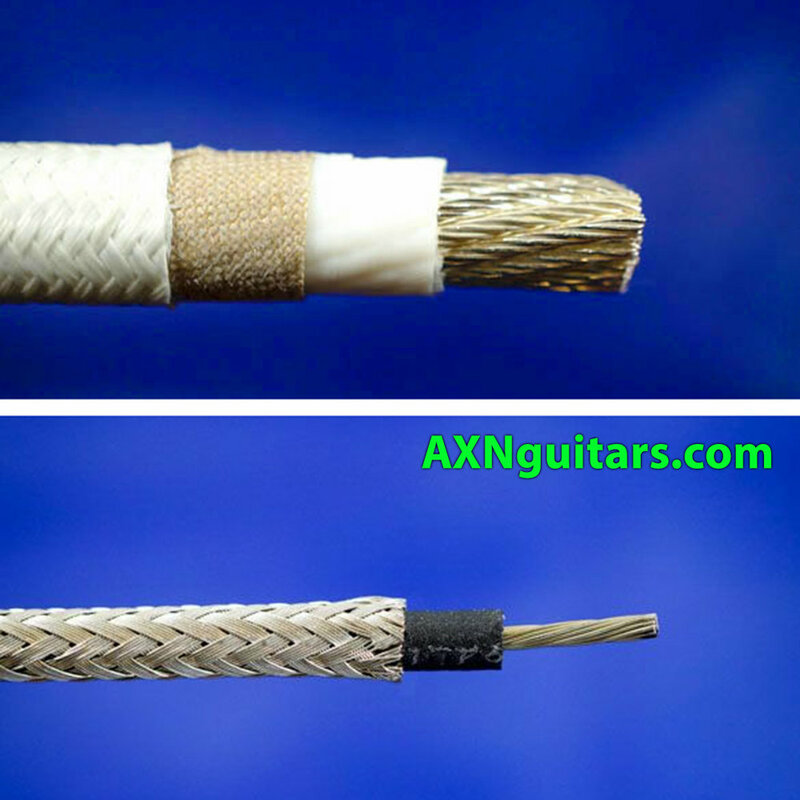 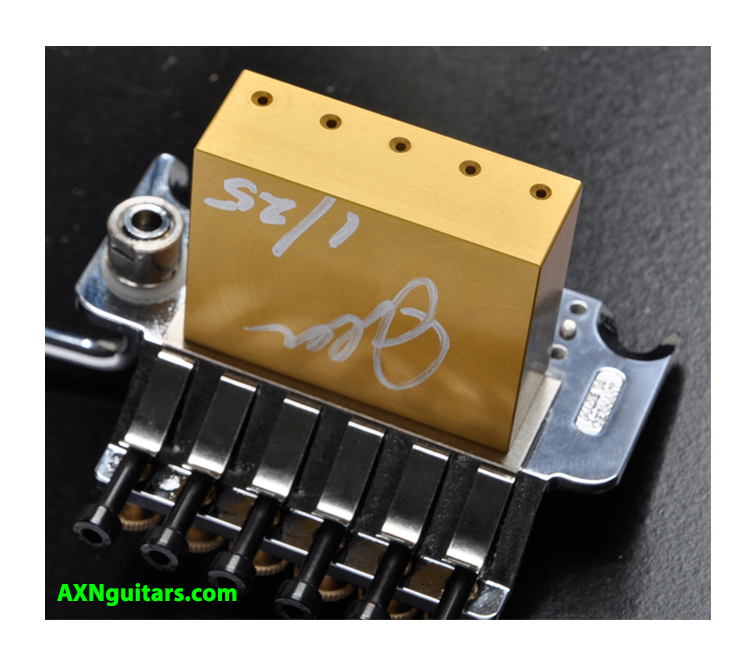 We do have a reference page with more information here AXN™ Tone Secrets. 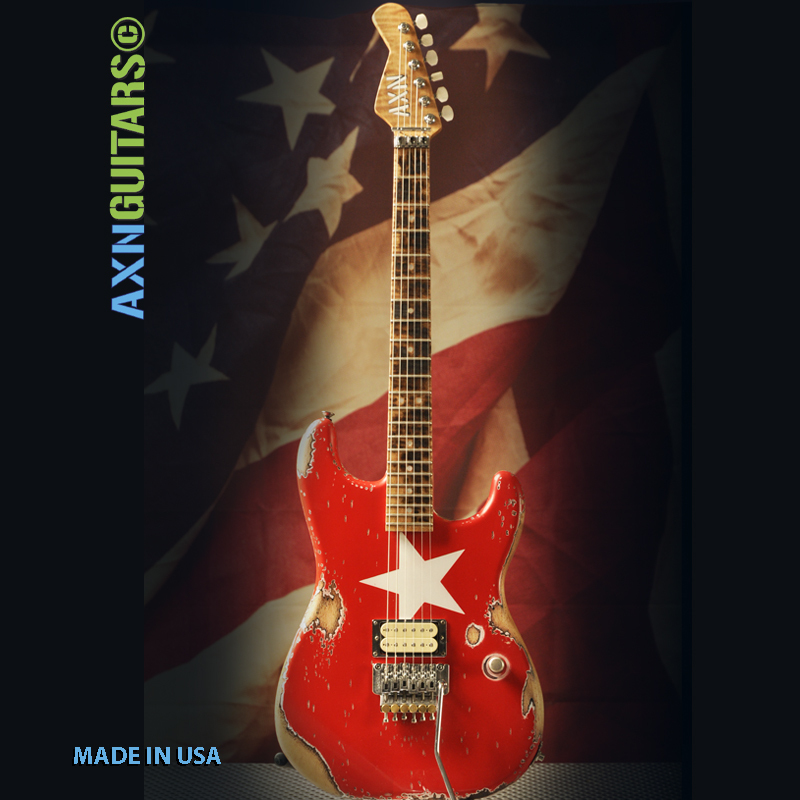 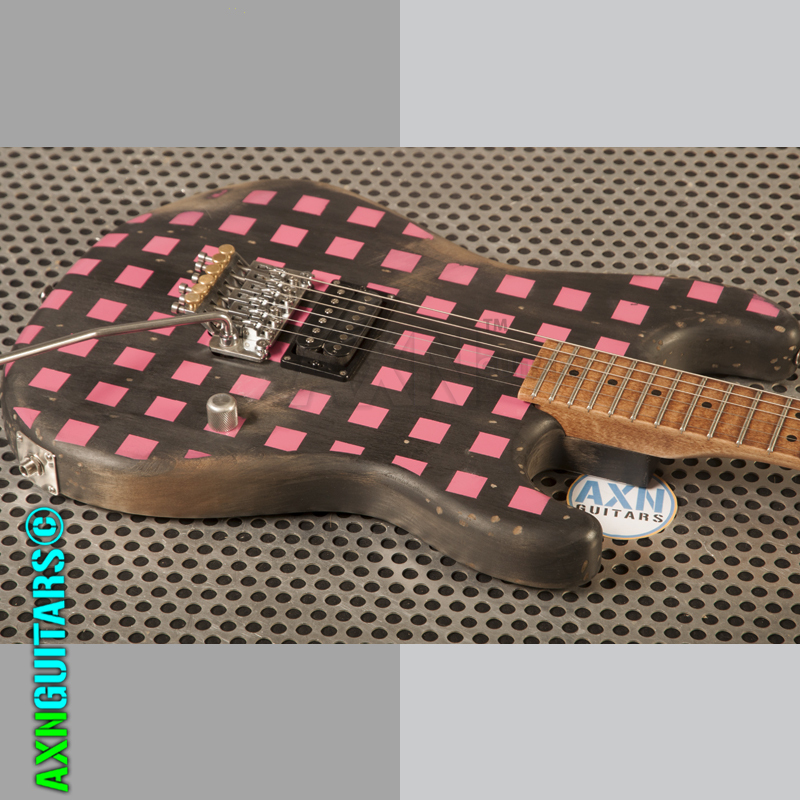 Two AXN™ Guitars were made with this artwork which is very very time consuming and the art and relic is more detailed than George Lynch’s original. 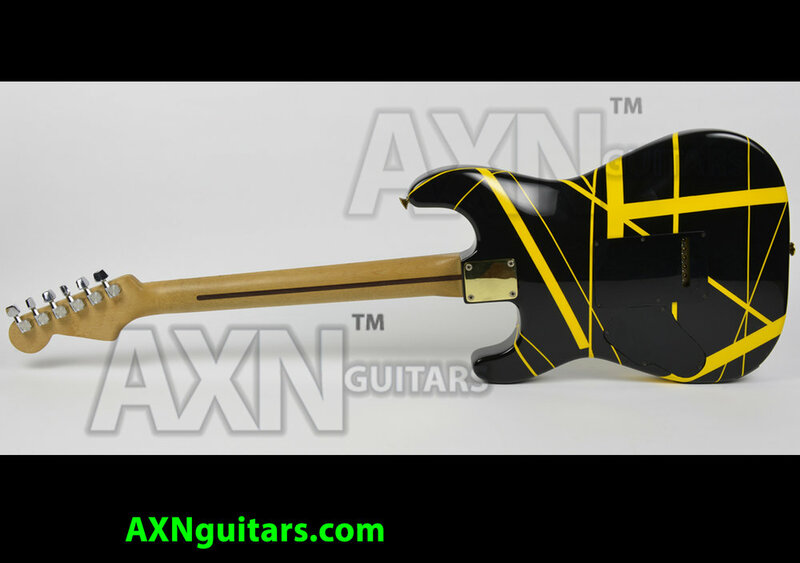 This is the Last One we will manufacture and discontinued. 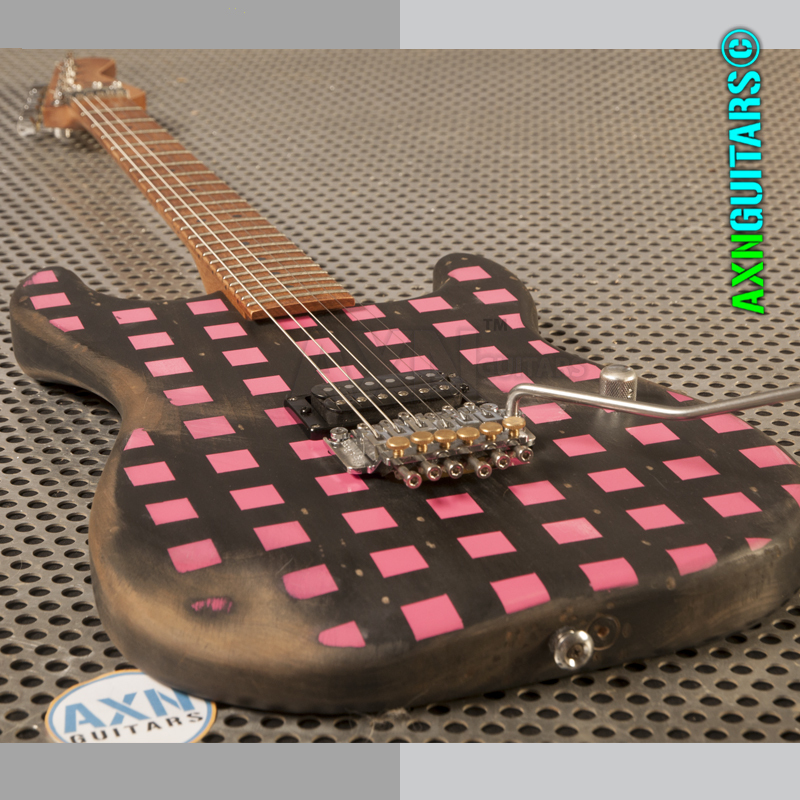 This guitar requires 2X the production hours than most of our AXN™ Guitars. 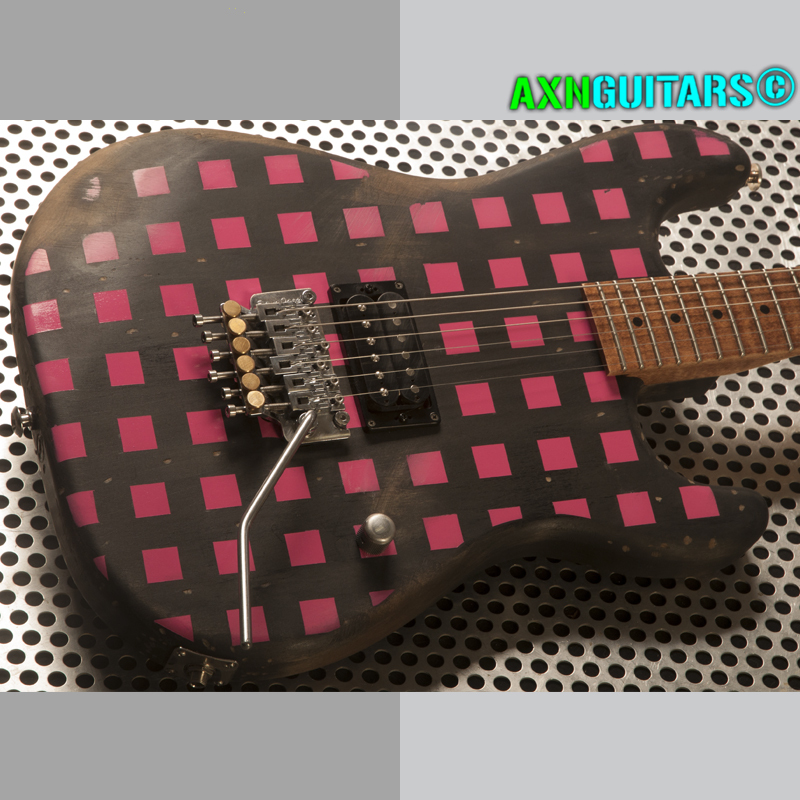 No corners were cut. 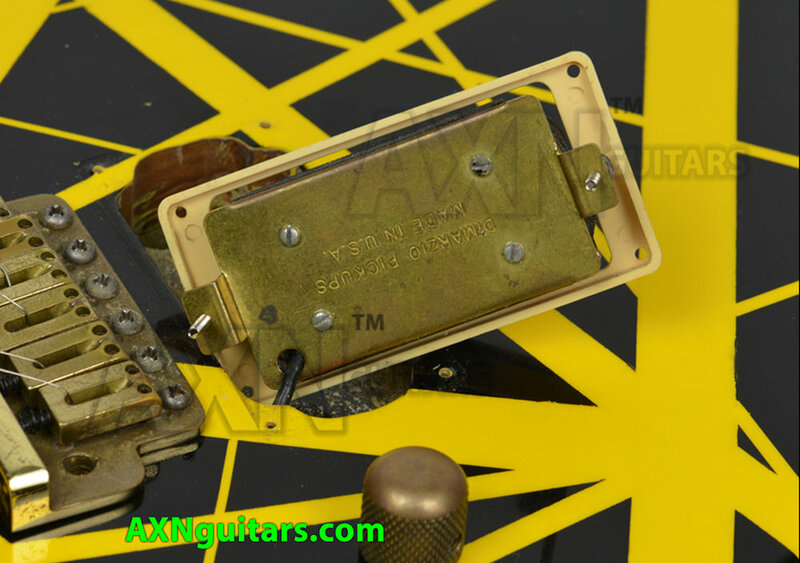 Every aspect of this guitar has the highest grade and highest accuracy to the original Mr.Scary. 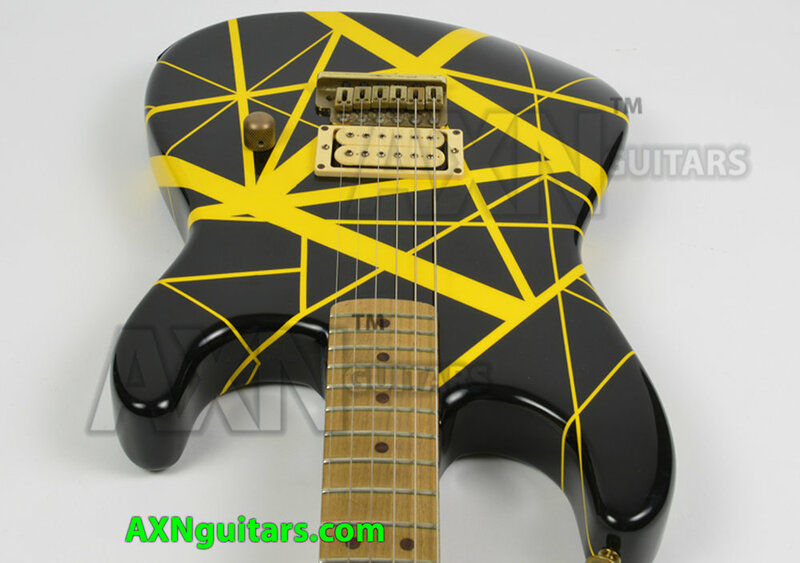 Much better quality guitar than the original Kramer Pacer. 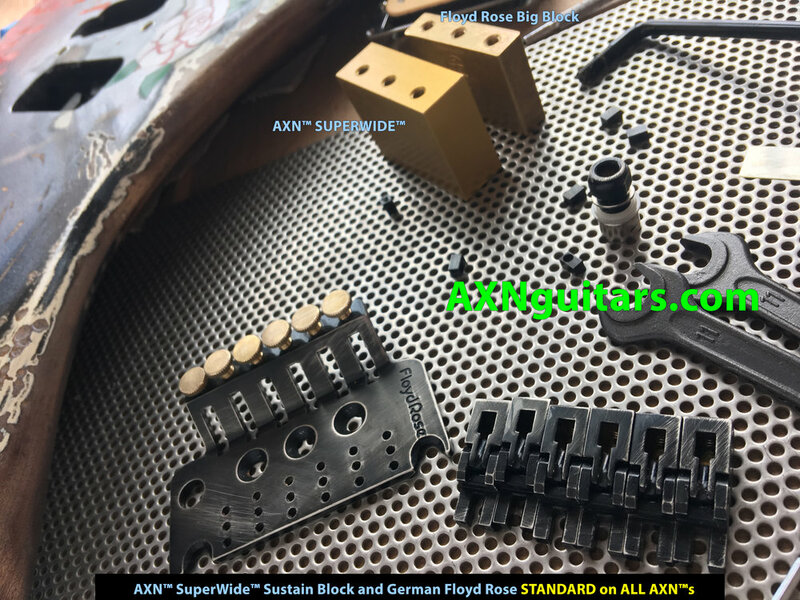 We’ve included a new Floyd Rose made in Germany complete system with our AXN™ SuperWide™ sustain block for the ultimate Floyd Rose experience and tone! 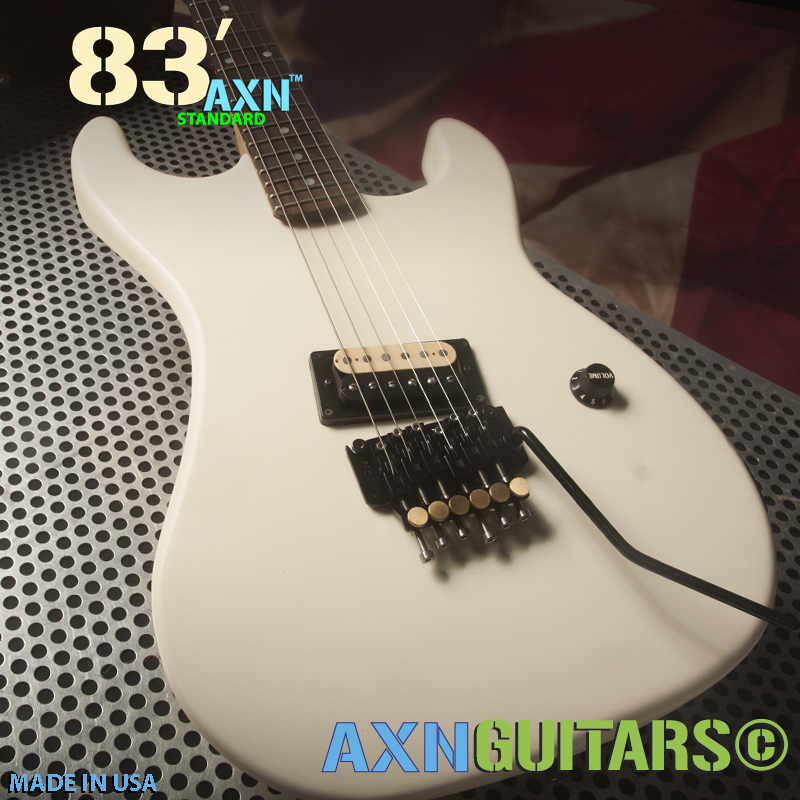 This ones got an accurate Holy Grail Kramer Banana headstock and the most collectible vintage Seymour Duncan JB wound in 1985 by Juarez.. just like George used! 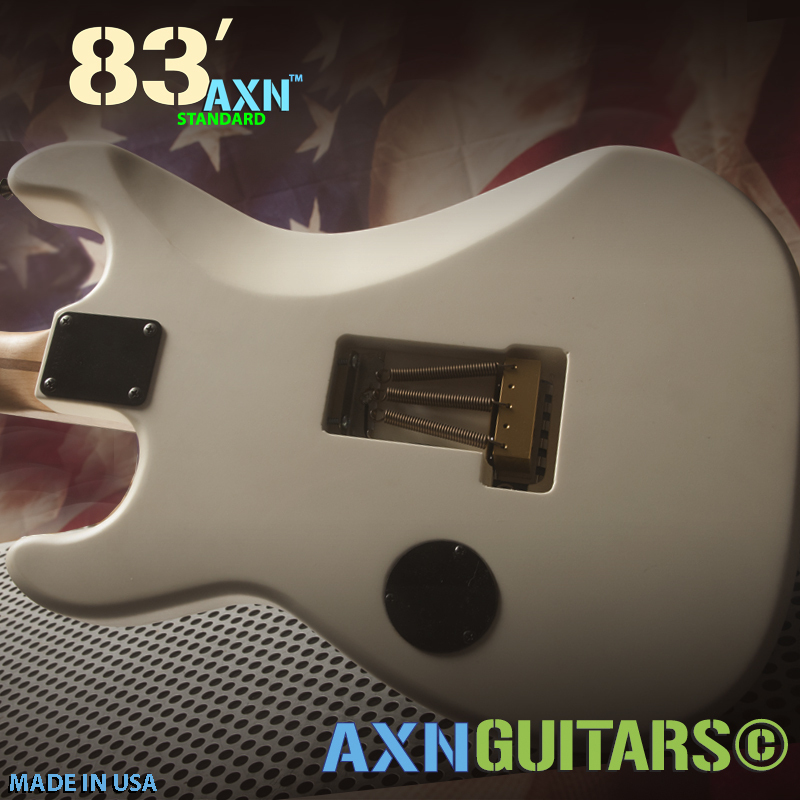 Joe, contacted us this week and is ready for a Custom Order AXN™ Guitar !! 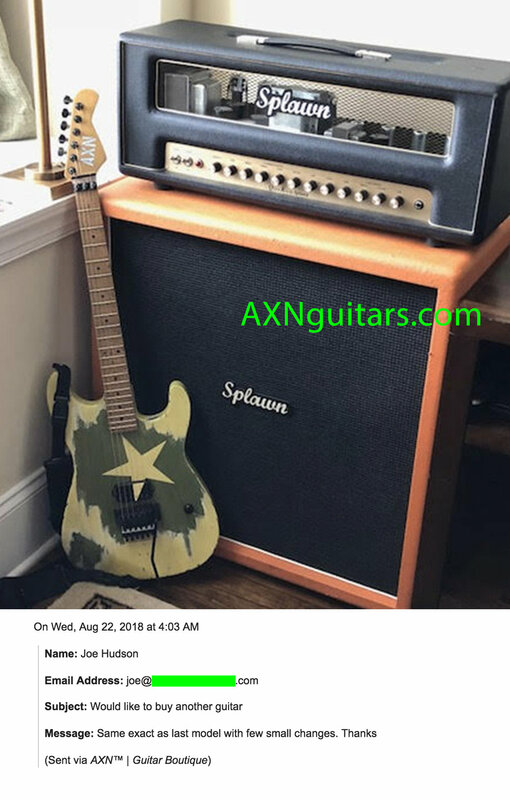 provided a photo of his AXN™ Guitar at his home.. Nice Setup Joe! 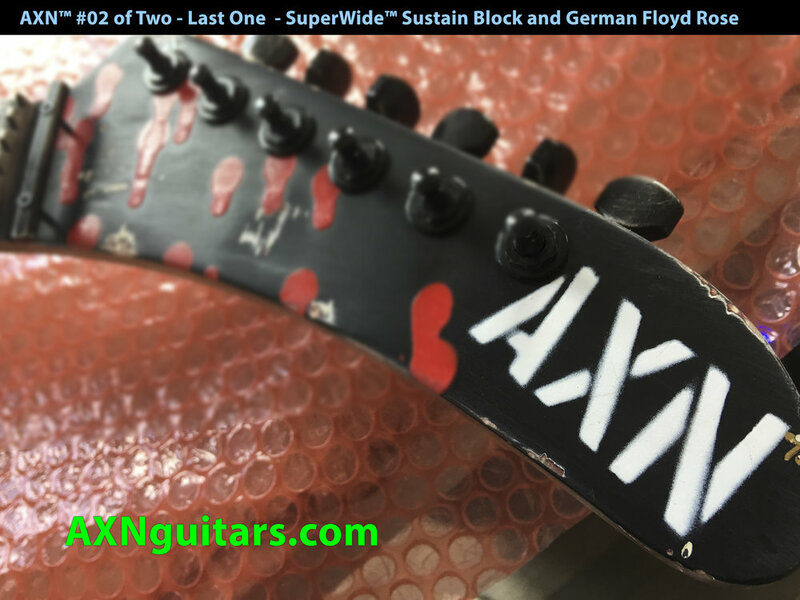 Scottsdale, Arizona - After collecting 1980s guitars with cool 1980s artwork for 30+ years Johnny from AXN™ Guitars has replicated the exact artwork directly from a select few guitars. 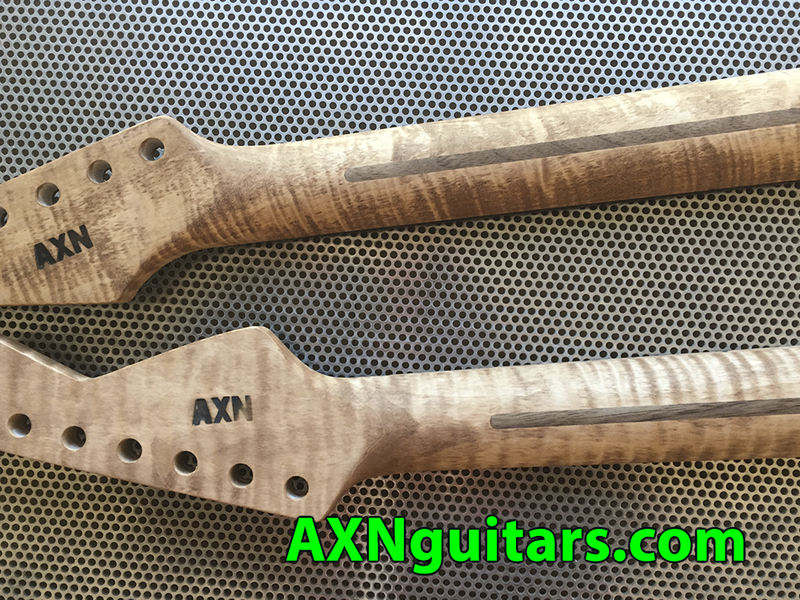 These will appear in the amount of 5 ( five ) AXN™ Guitars for each design. 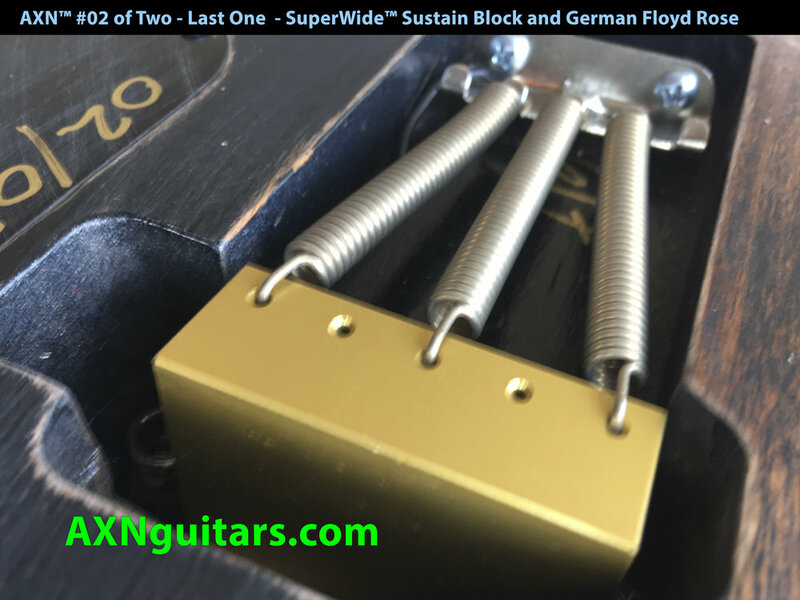 Due for release in fall 2018 and early 2019. 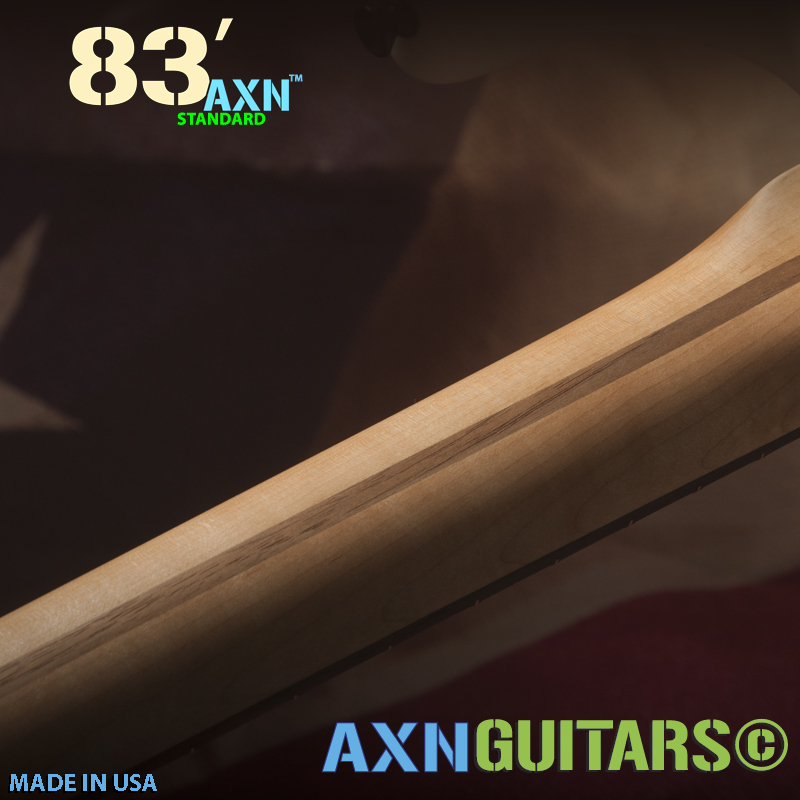 Johnny noted that every AXN™ Guitar body is manufactured in the USA from prime 2-piece and center joined exotic woods. 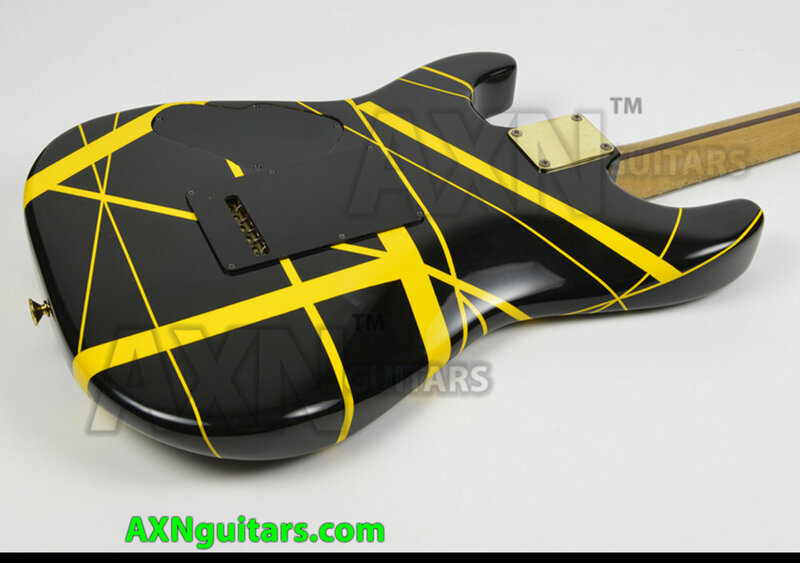 Also ALL our guitars are FREE of tone robbing clear coat and under paint fillers. 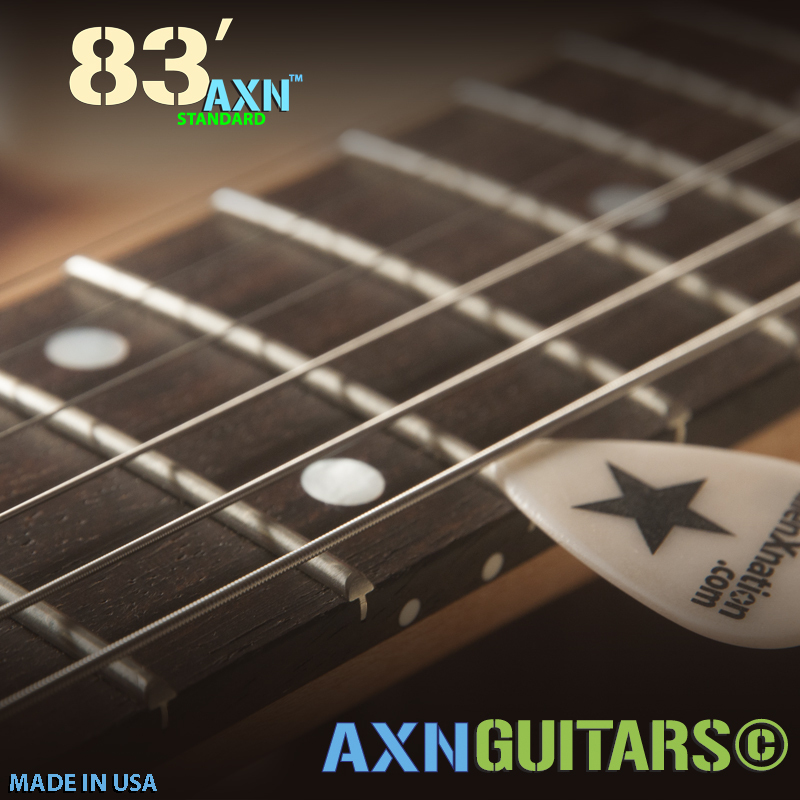 “We’ve expanded our manufacturing shop. 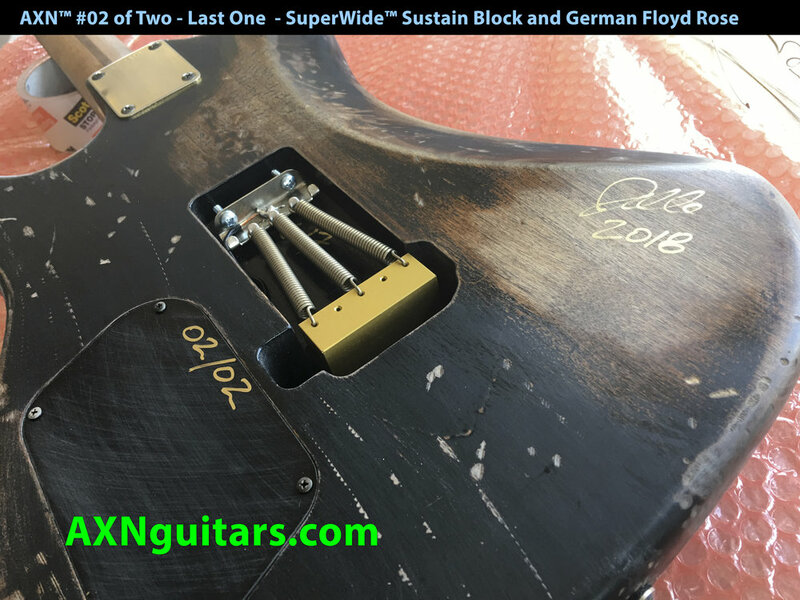 The expansion was basically due to the fact that early in 2018 we could not meet the demand for custom ordered guitars. 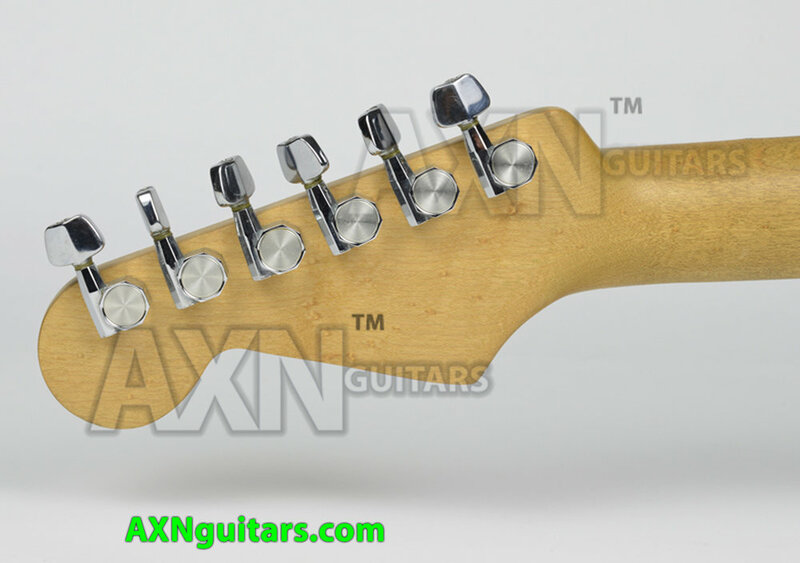 Therefore, there was a decrease of in-stock guitars ready for immediate purchase. 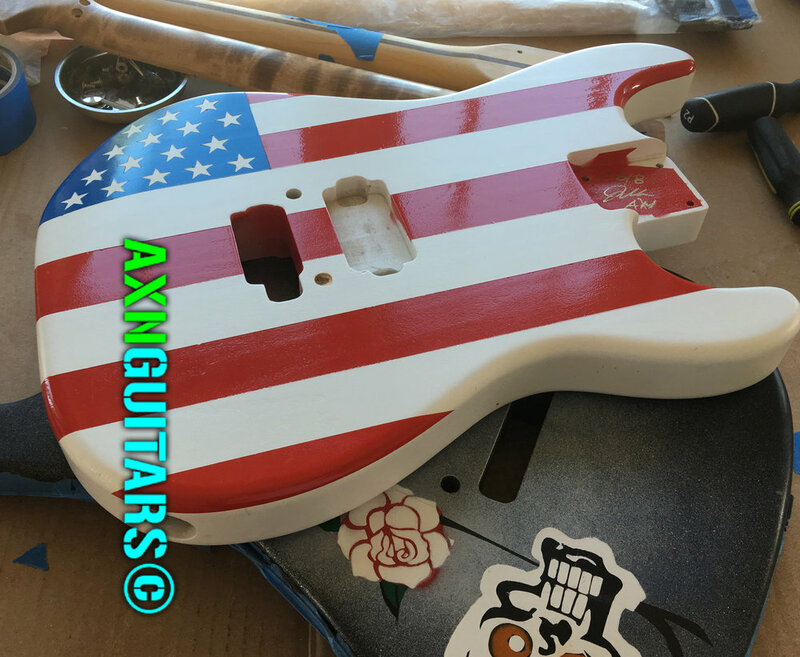 Now we are doing everything we can to increase available and in-stock guitars that stay posted on our Available Guitars web page” . 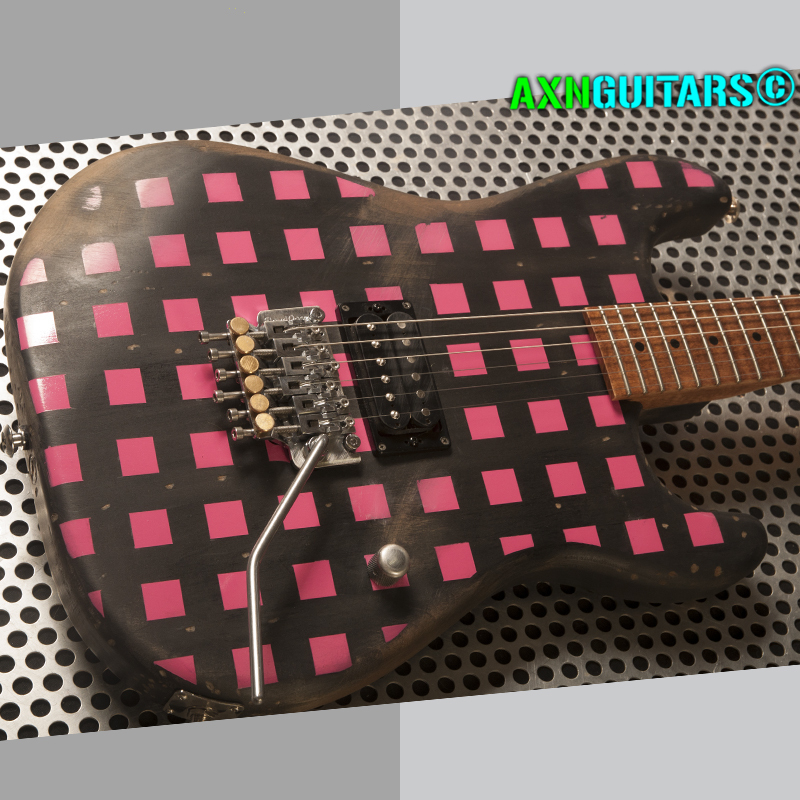 Fernandes and Brad Gillis have both stated that 100 guitars were manufactured that matched the guitar he used live in 1984. 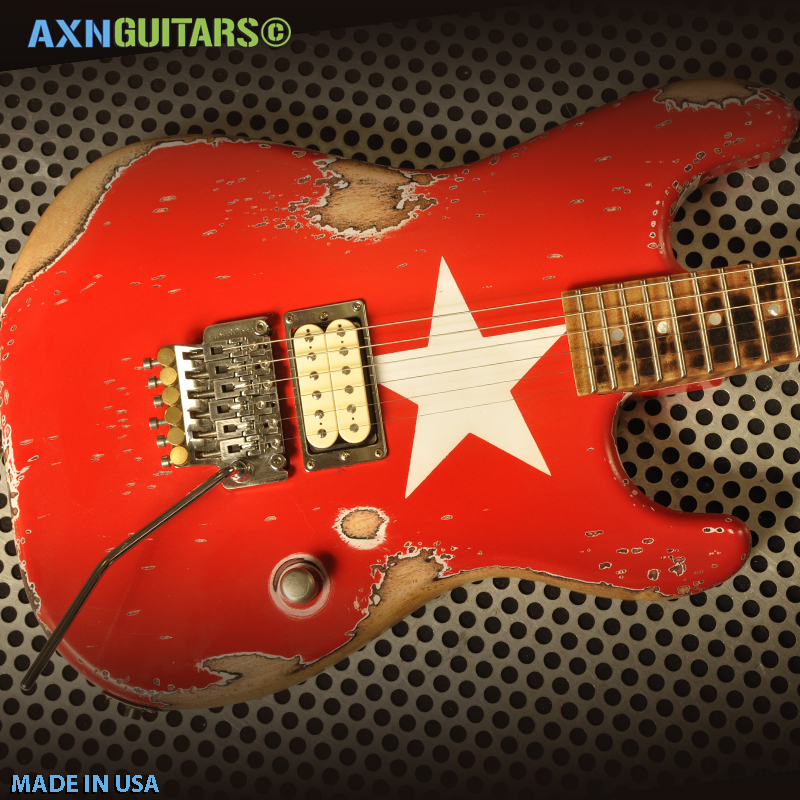 That would be the ST155BG Fernandes. 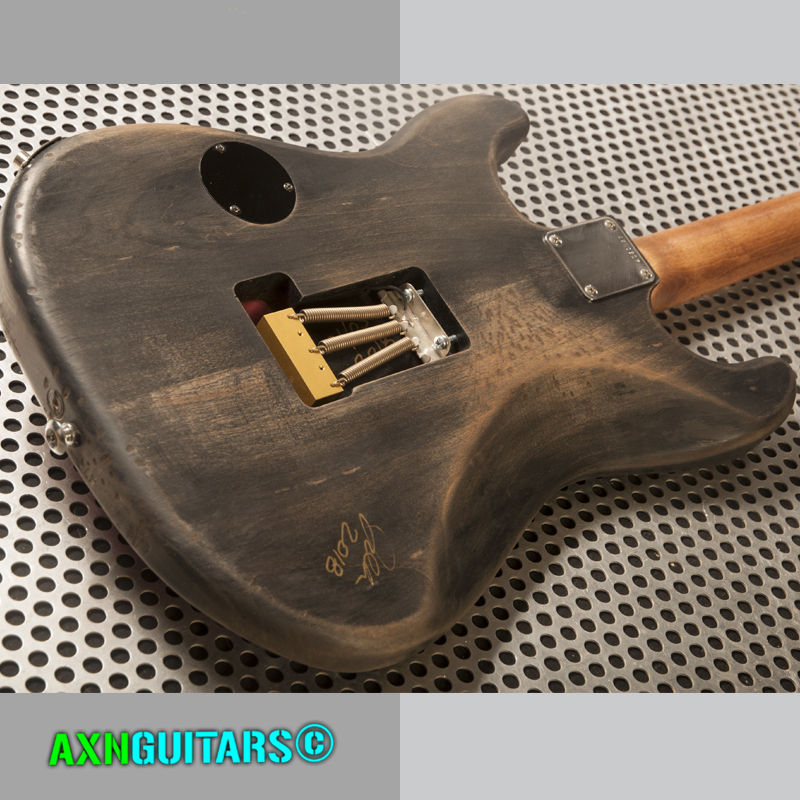 Fernandes also produced many Model ST-120BG guitars that were identical to the ST-155BG except for a few things. 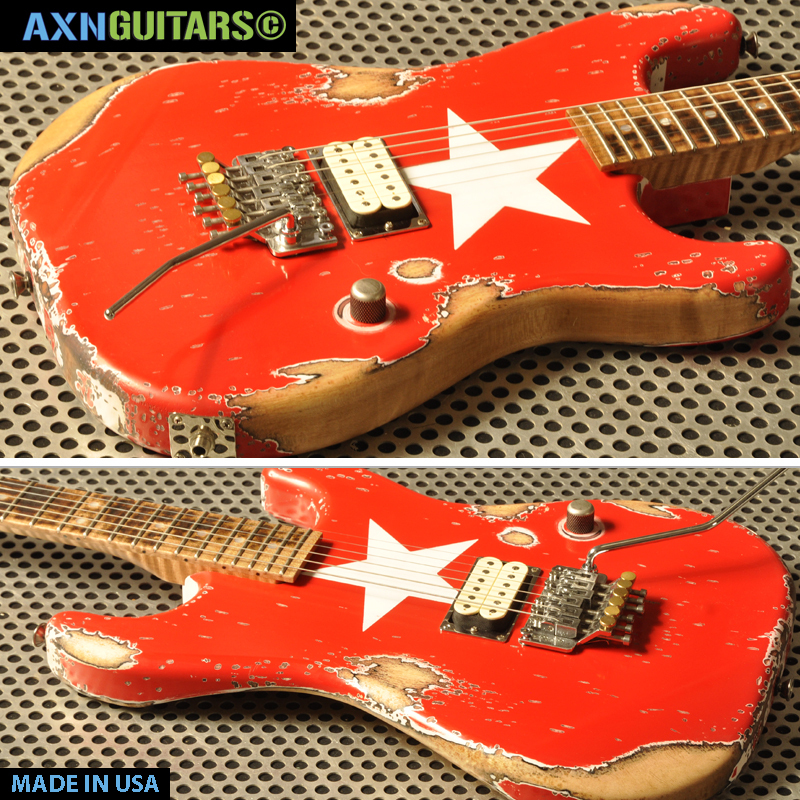 This is one of 100 guitars produced! 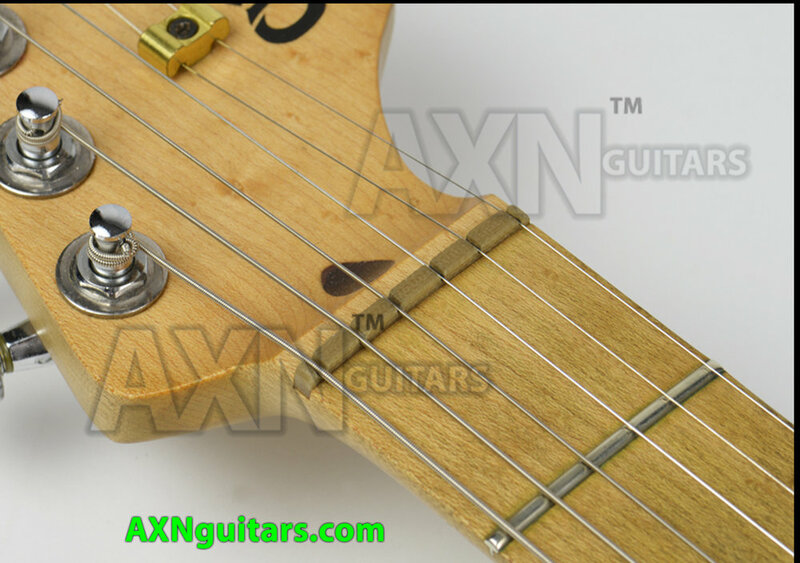 We have never seen an ST-155BG in person that was unmodified. 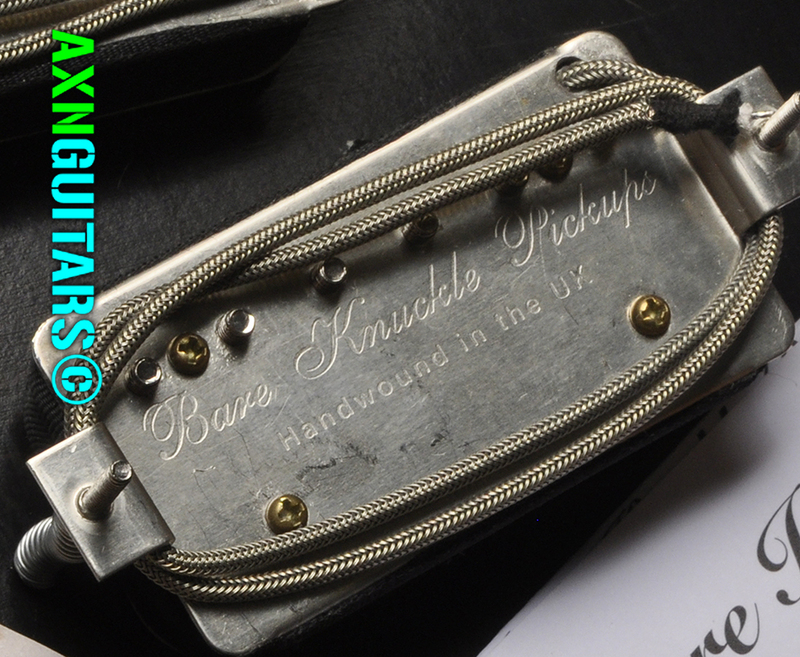 This is the first one we have owned in absolute original factory condition. 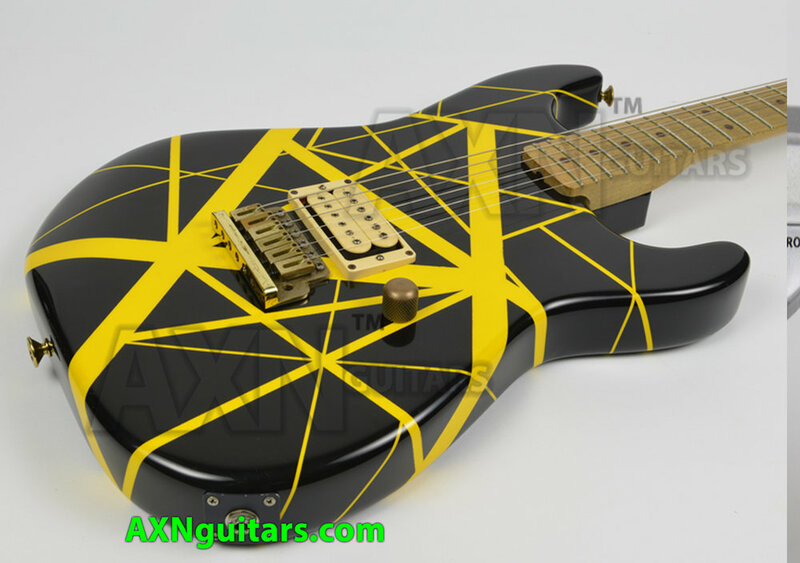 Every other Fernandes Brad Gillis we've seen in this great of condition was a model ST120BG. 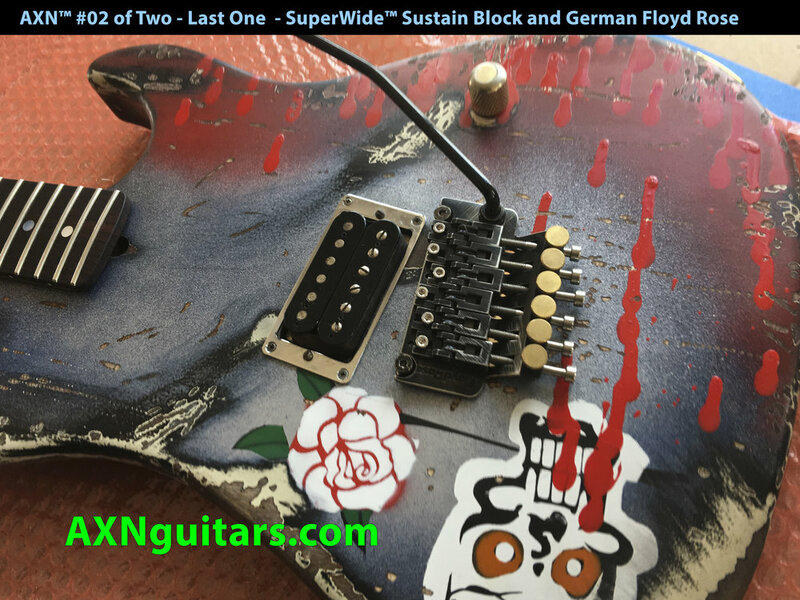 includes a complete breakdown and inspection of every element of the guitar. 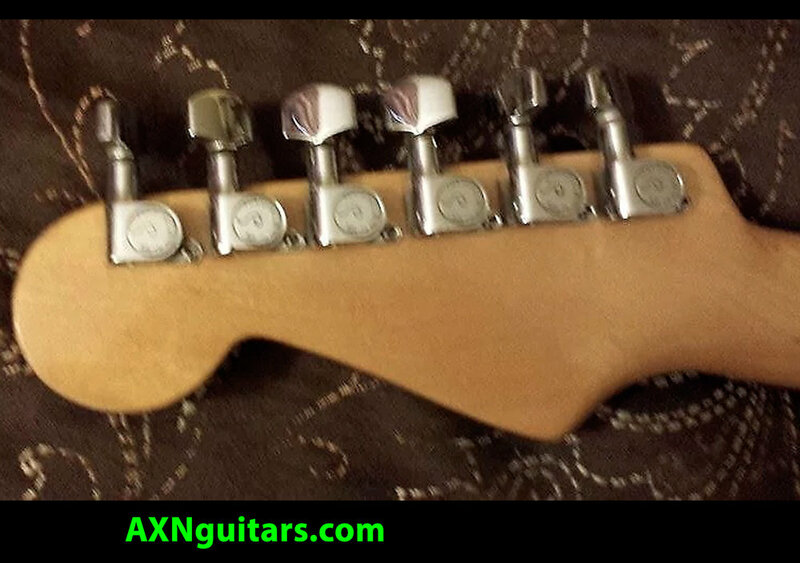 This includes breakdown and cleaning of the tremolo bridge and inspection of all parts!! 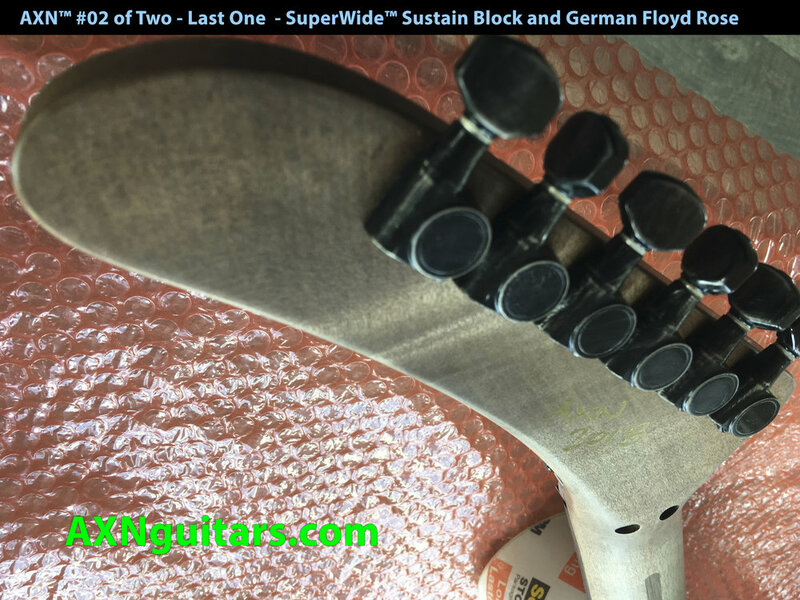 Entire guitar will be delivered 100% like a new guitar with a certificate of Authenticity. 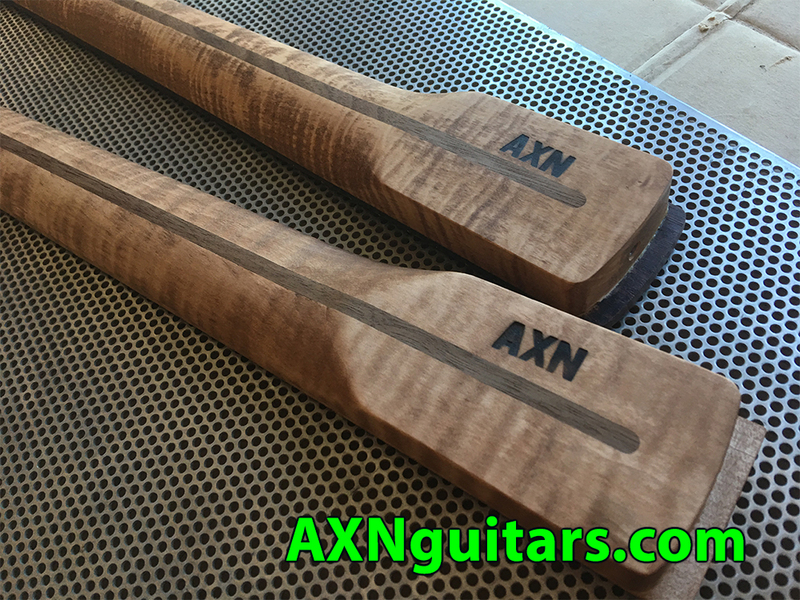 I am very proud to announce that my company AXN™ Guitars has taken a leap forward with an expanded new facility located in Arizona USA. 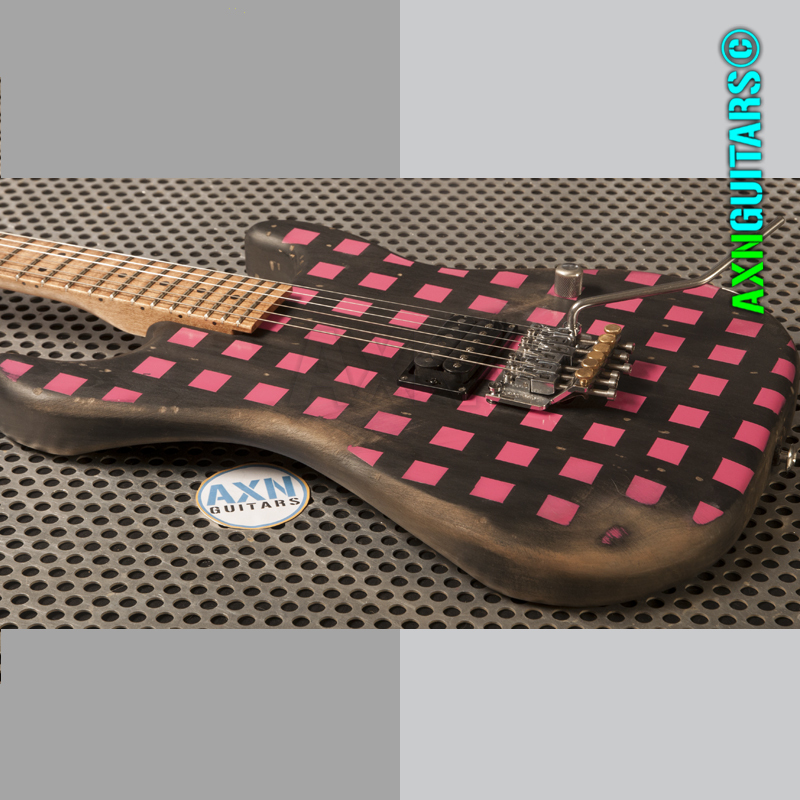 There will be no CNC machines because these create sterile guitars. 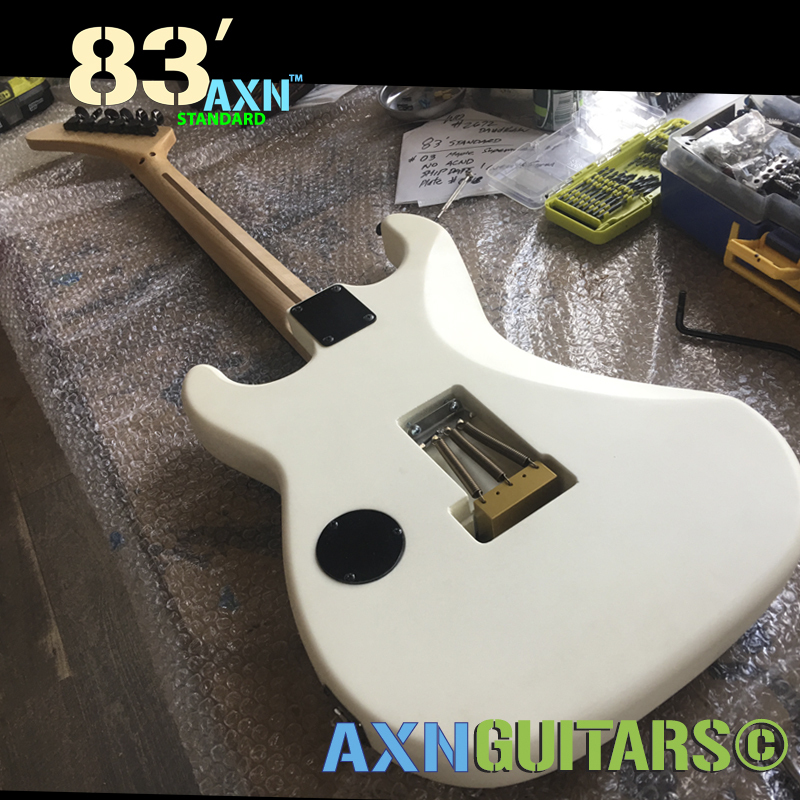 Yet, with the addition of some new machinery, the extra workspace and a bit of rocket science, we plan to provide the best level of hand craftsmanship possible in every instrument! 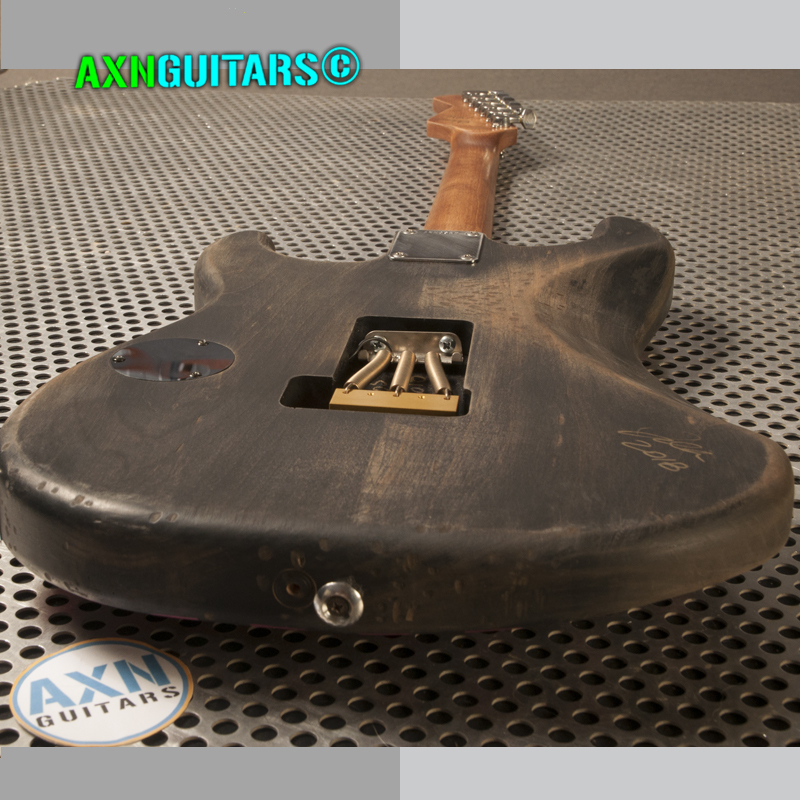 We will continue to manufacture our guitars the OLD-SCHOOL way using old-school methods just like those two name brands did in the 1950sand 1960s. 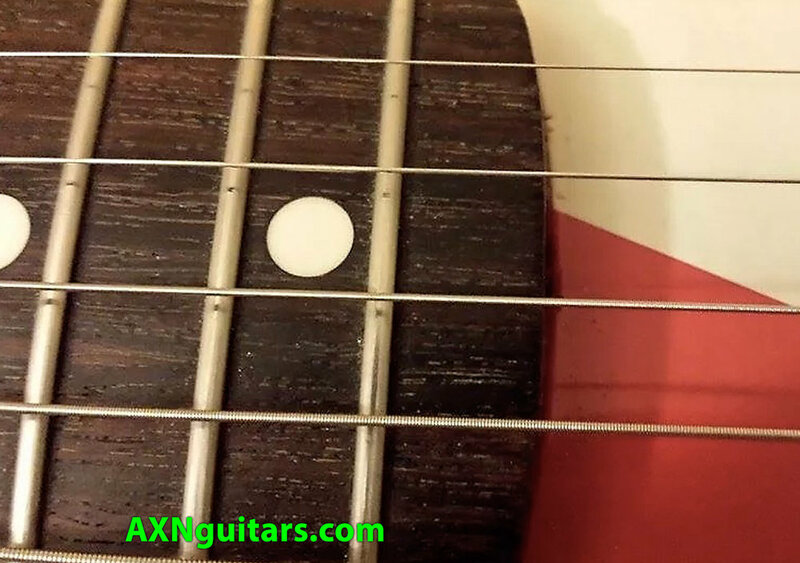 This video shows the newly completed building on my ranch in Arizona USA. 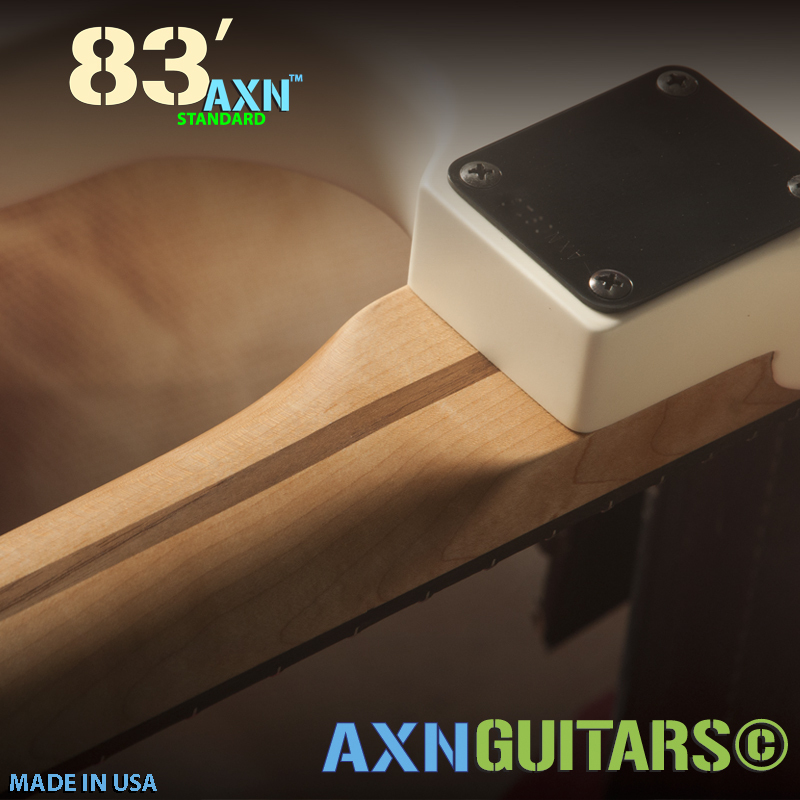 This is where my AXN™ Guitars will get all the creative tweaks to the wood everyone is talking about. 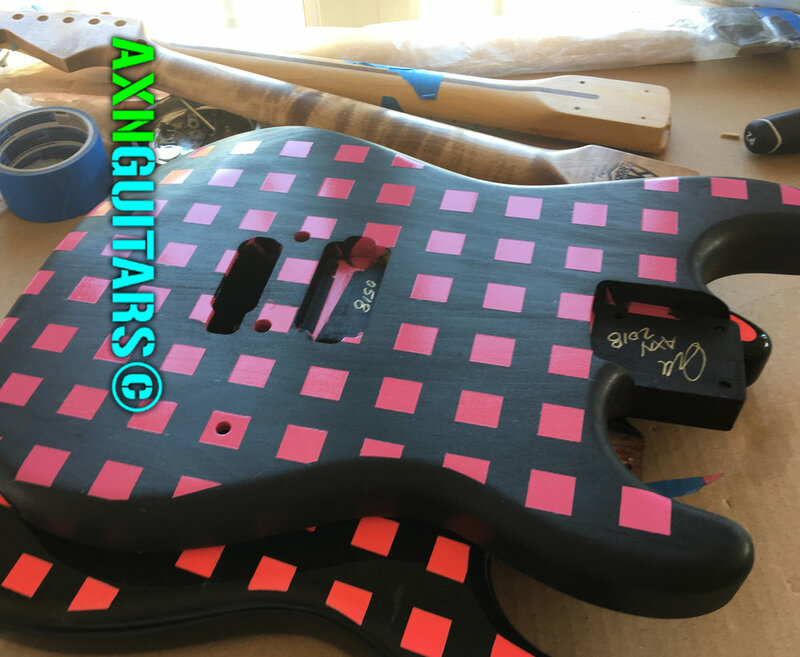 It will also host a design and demo department where I will spend many hours dissecting guitars and performing R&D in a live musical environment. 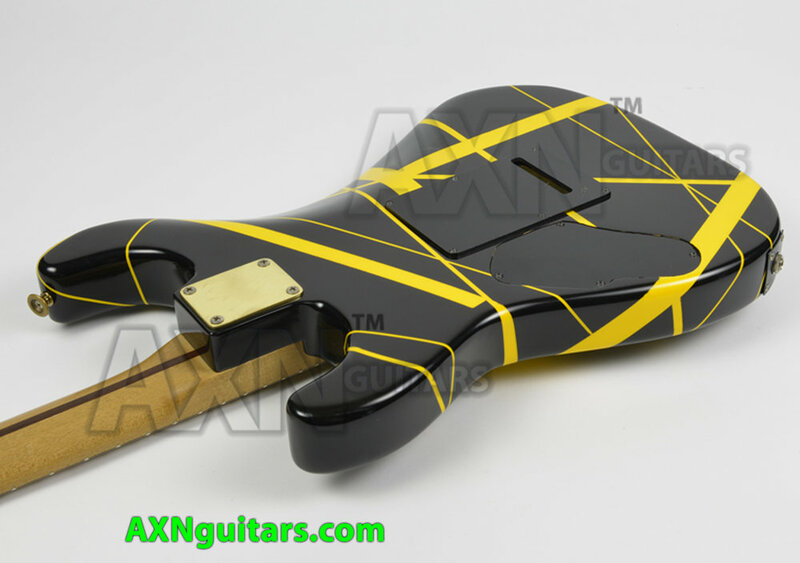 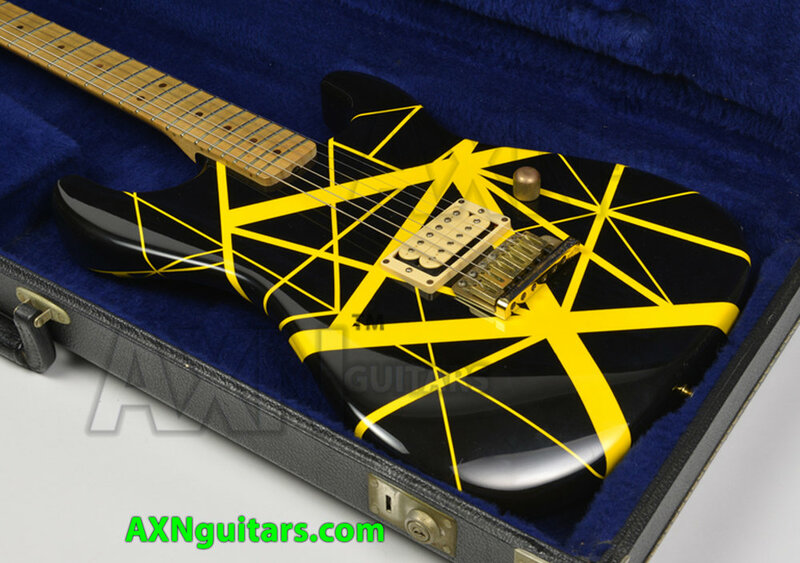 History of Eddie Van Halen's Bumble Bee / Notes Taken!! 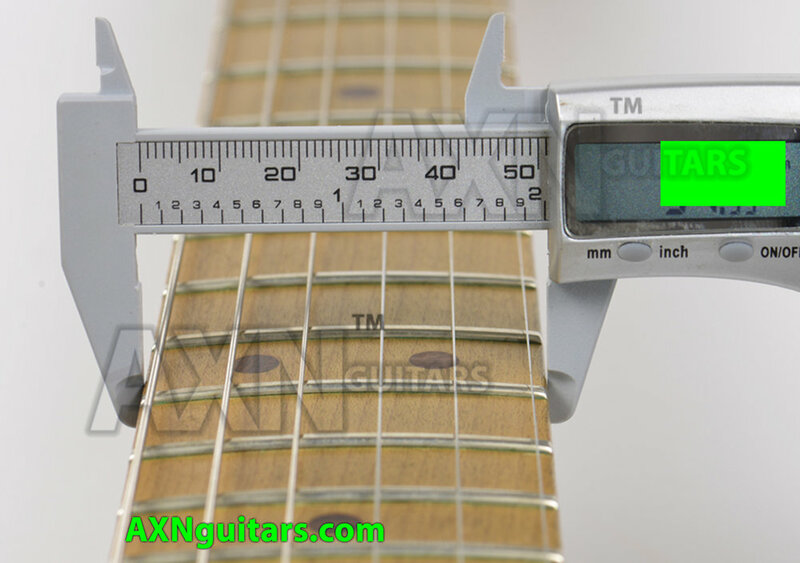 WTF - Boogie Bodies, Charvel, Dimarzio get out the measuring tape dude! 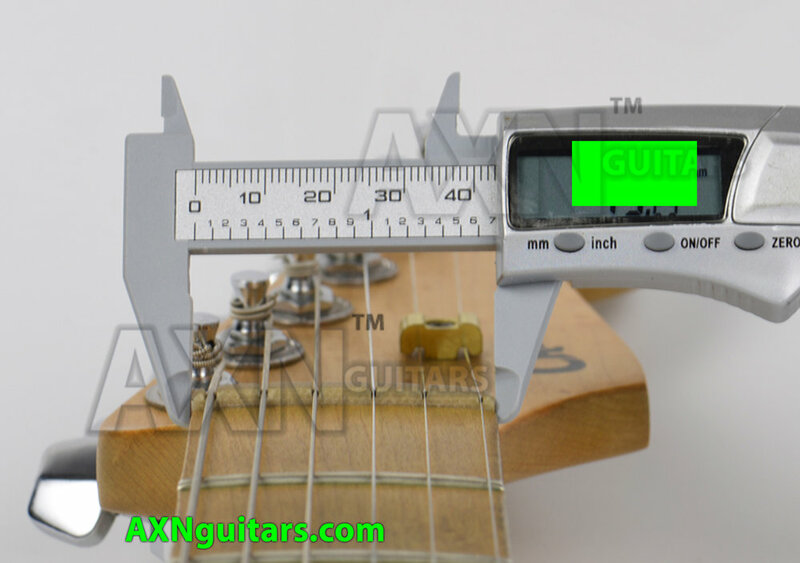 For many years I recorded detailed specifications and measurements of virtually every part of certain brands of guitars from this era the 1980s. 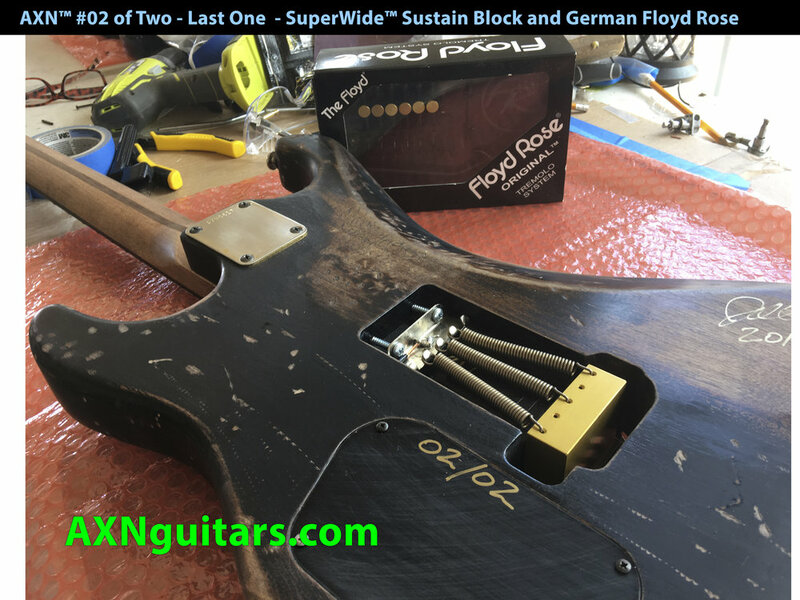 Sometimes the facts are sitting right in front of my nose and all have to do is lookup... wow ! 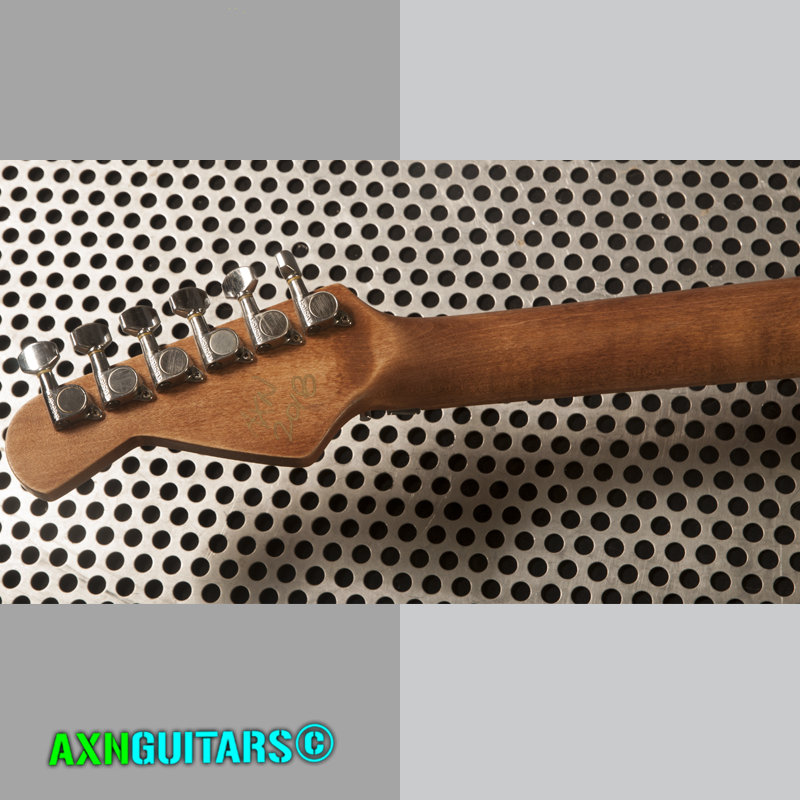 Johnny, The SENSEI OF VINTAGE 1980'S GUITARS 禪 ( translated SENSEI 禪 = the teacher ). 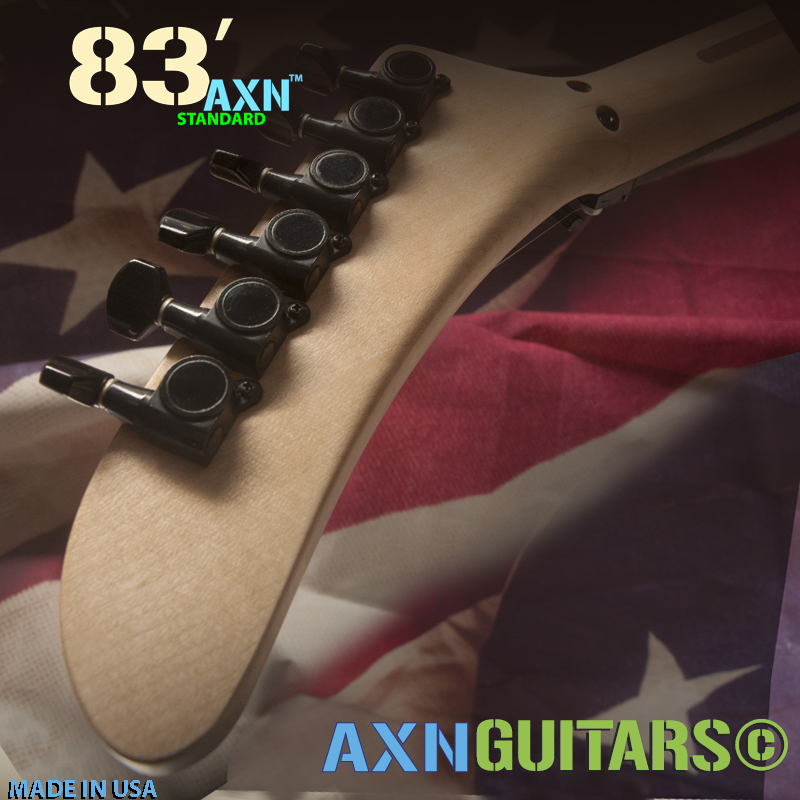 No matter what country we live in we all shop and buy stuff thats made in china one way or another. 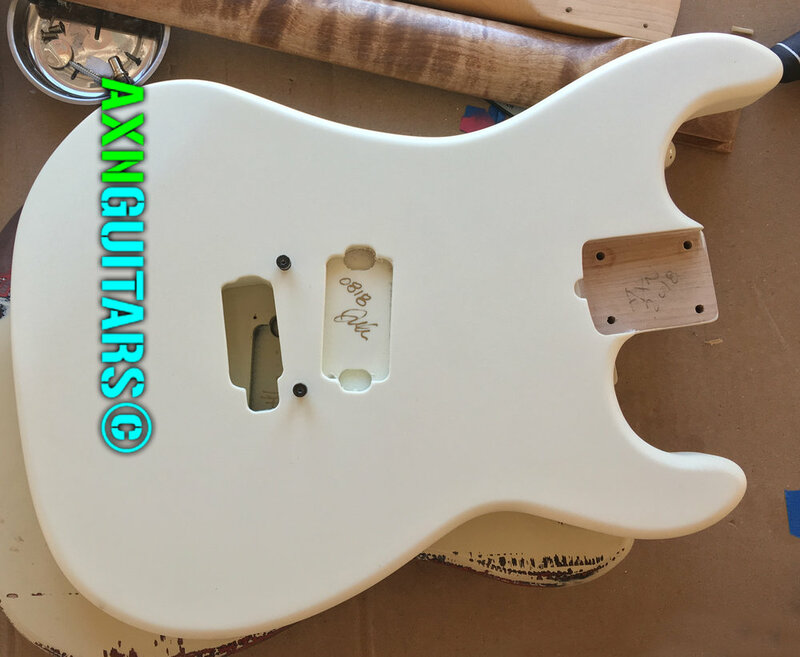 Maybe its a power tool or maybe its the tires on our car or truck but one way or another we und up buying Chinese junk whether we know it or not. 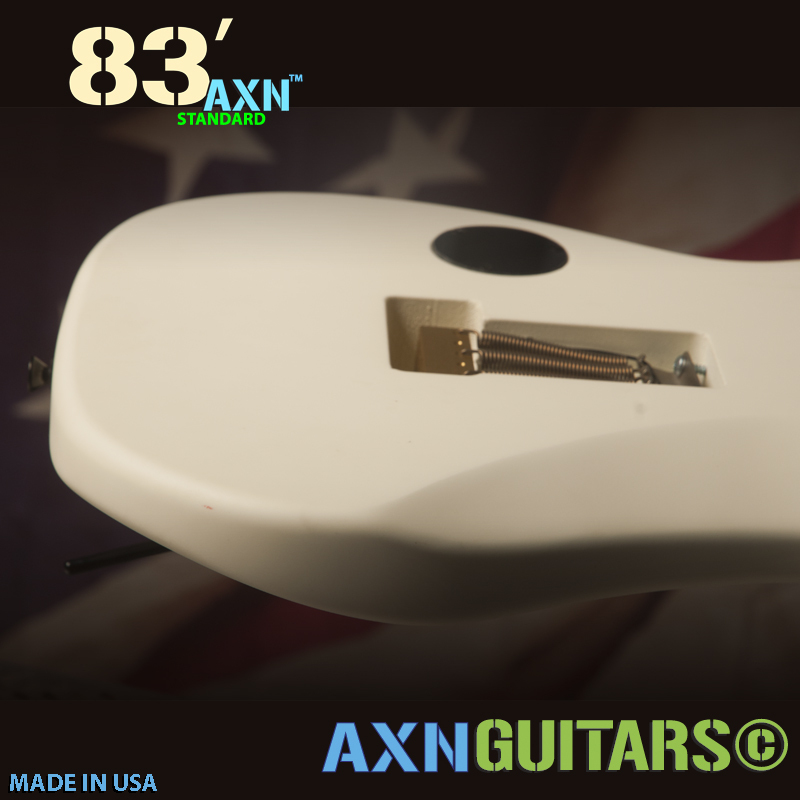 Its one thing to go replace the toilet seat and purchase something made in some factory in china. 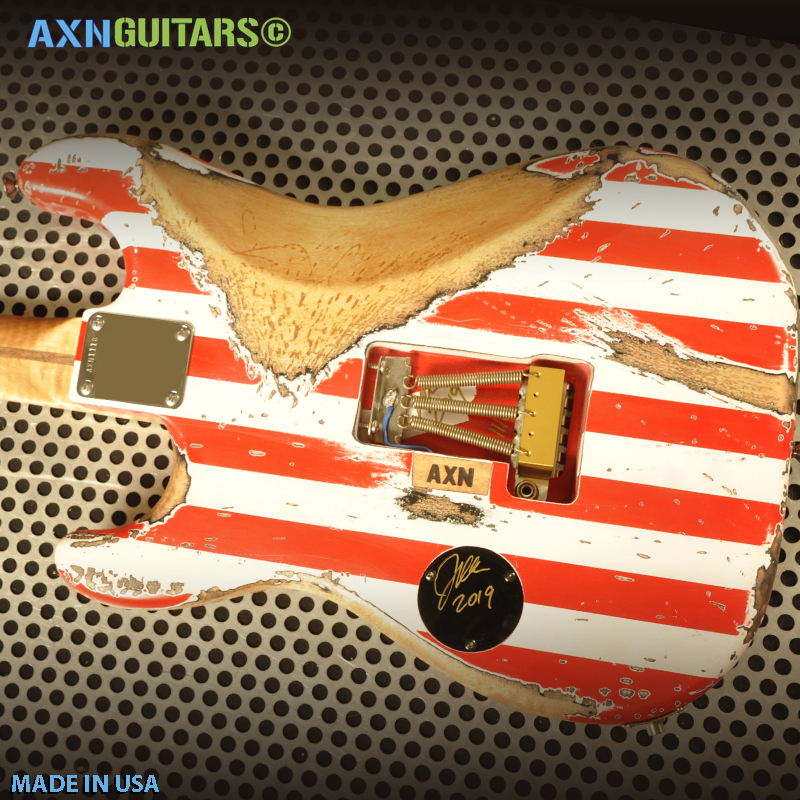 It unavoidable because it just so happens that ALL the toilet seats are made in china and we have no choice. 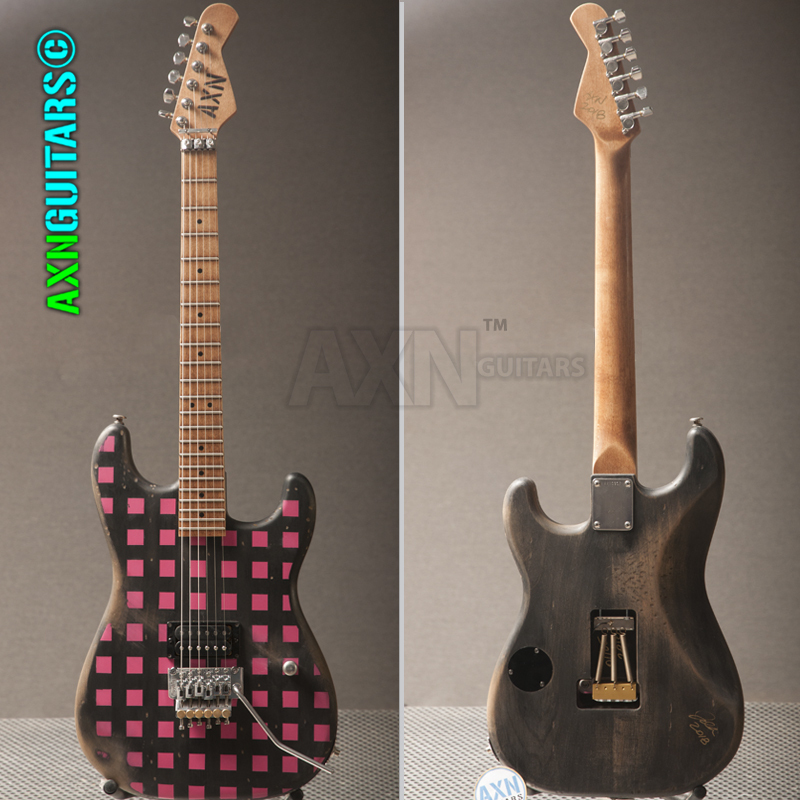 Now the thing is with guitars we do have a choice. 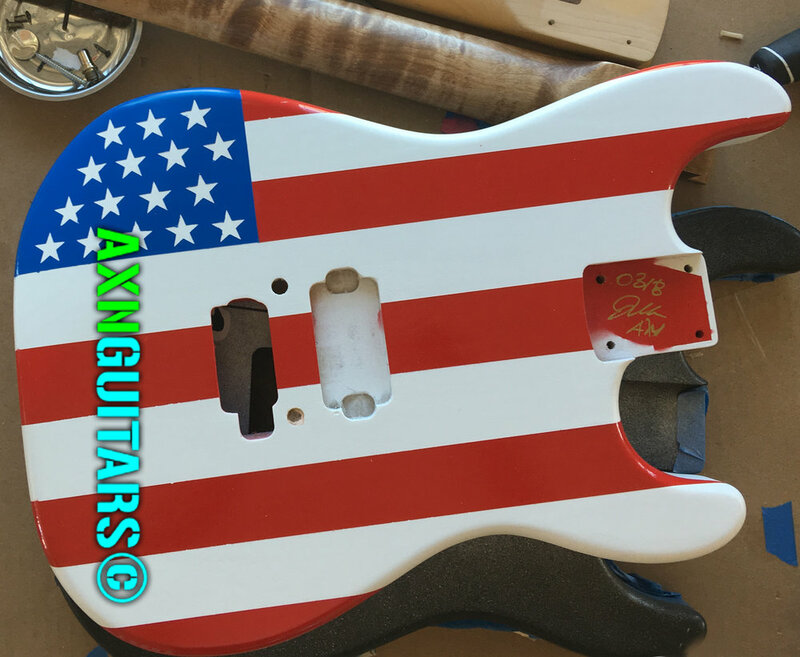 There are many boutique guitar builders here in the USA and in your country that build exceptional guitars and these builders are not selling us all out by manufacturing guitars in china and importing them just to make a buck. 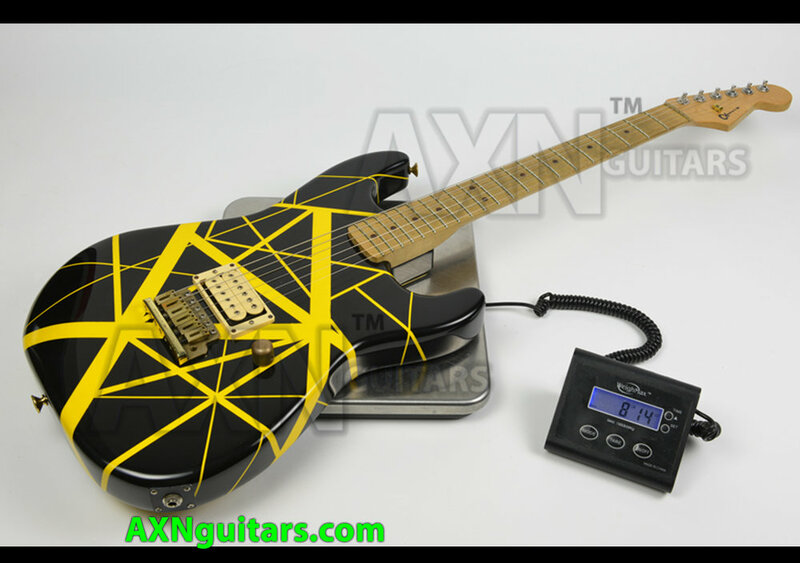 The even more surreal thing is basically in all guitar price ranges there are the Chinese guitars and non-chinese guitars. 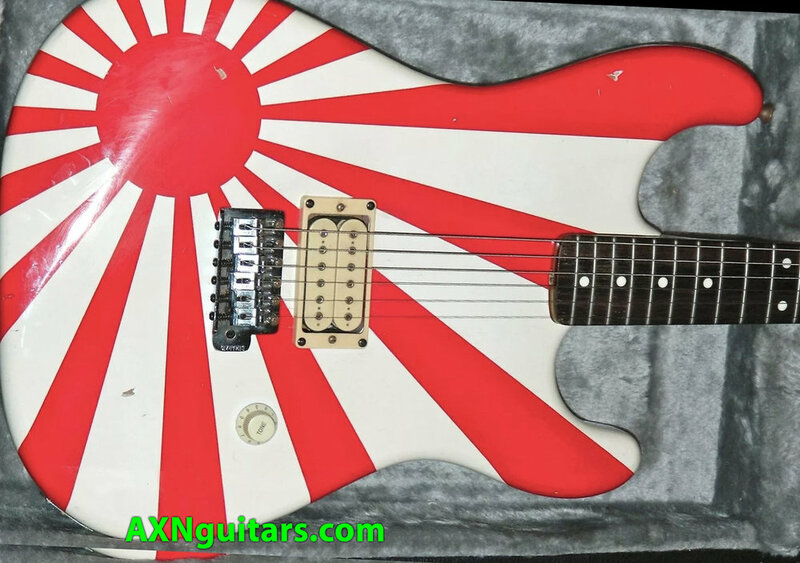 You don’t have to buy them... just face it you don’t need to buy Chinese in any price range >>> Here is Why. 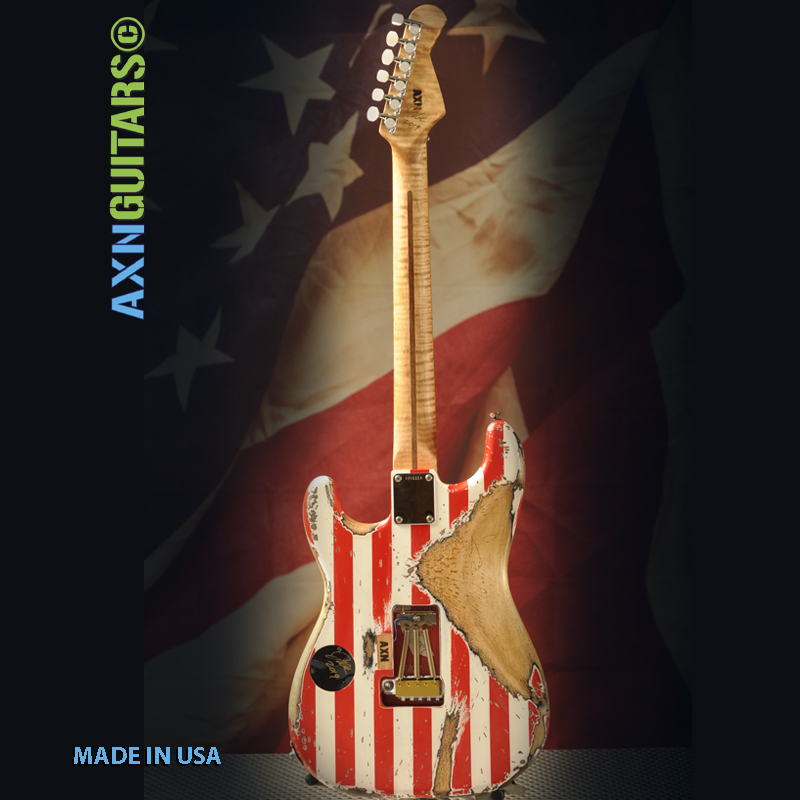 #5: Save America’s Jobs and the jobs in your home country - Don’t Buy Made in China. 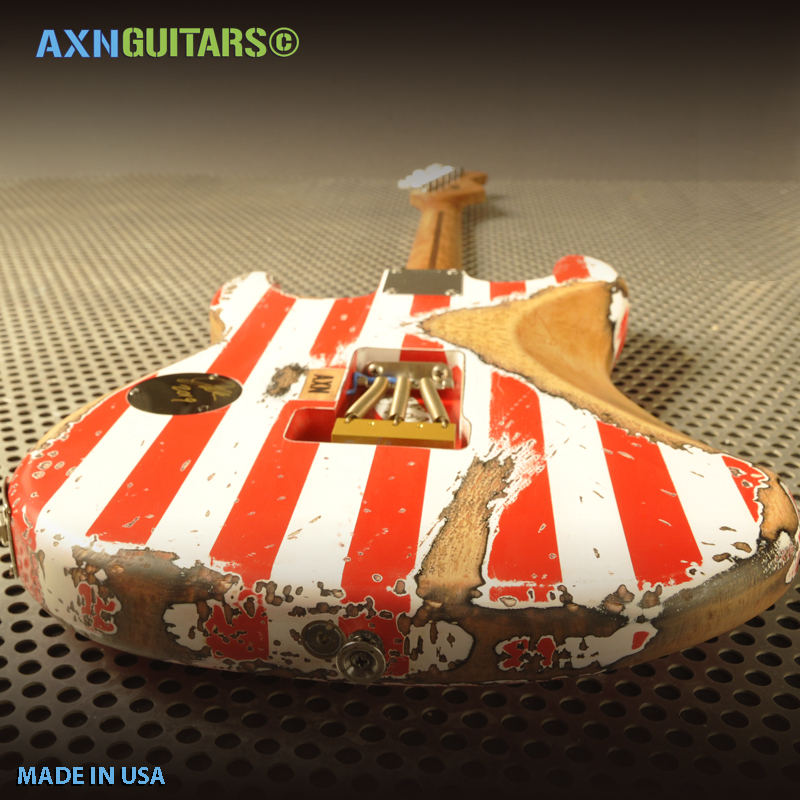 #6: Save Jobs and the jobs in your home country - Don’t Buy Made in China. 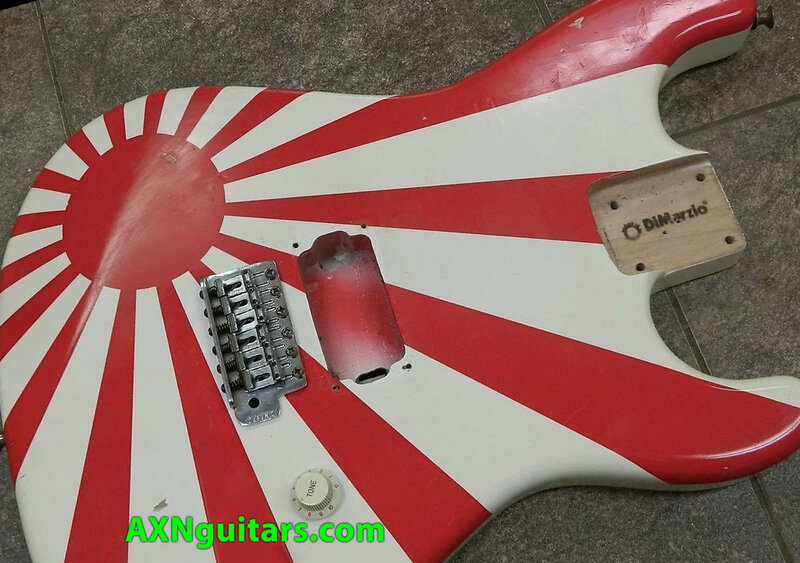 * China manipulate their currency, have poor working conditions for their workers and destroyed the environment with toxic refuse that reaches us all. 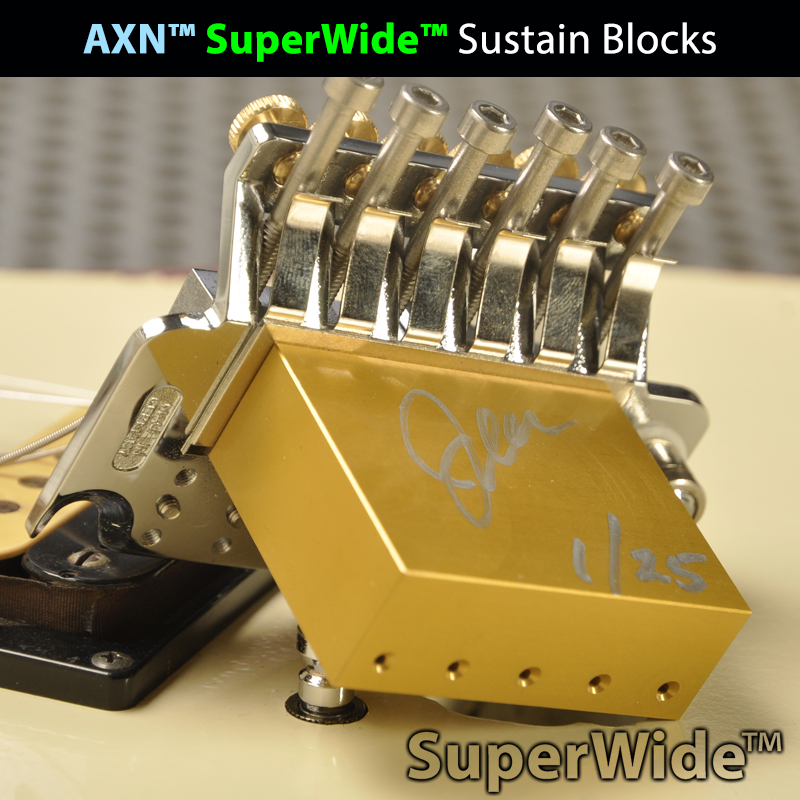 We are happy to announce the success of our AXN™ SuperWide™ Sustain Block part of our Disruptor™ brand of products. 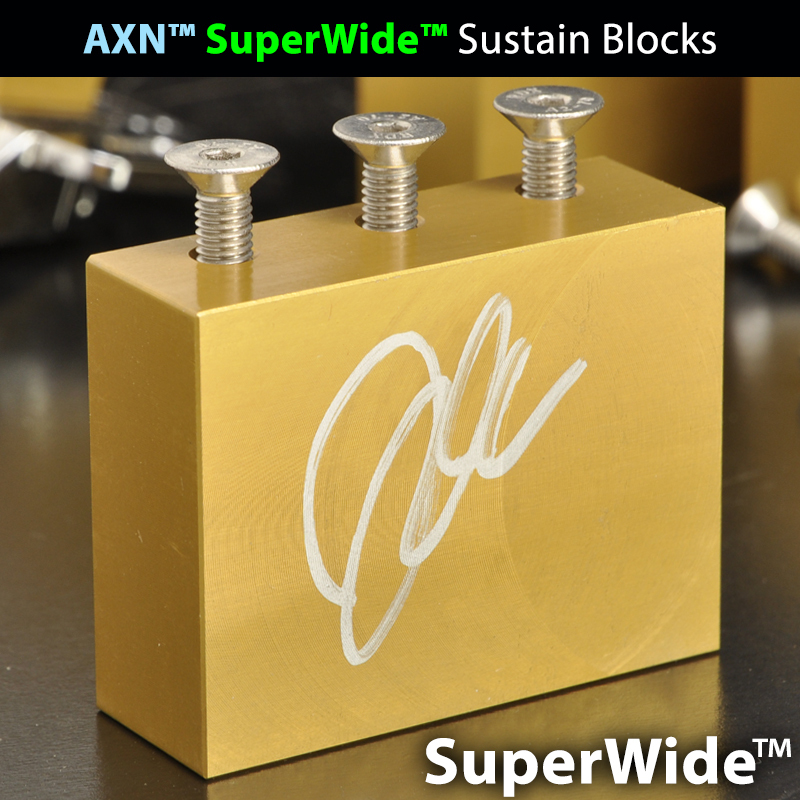 The first prototype run of AXN™ SuperWide™ Sustain Blocks, which is machined from a well tested exotic metal, have arrived and are pictured in the promotional video. 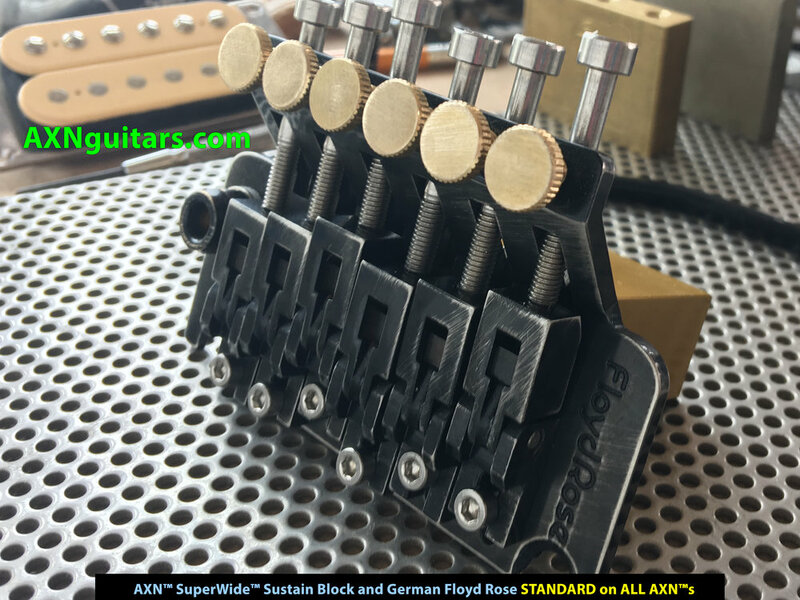 Our 2018 AXN™ Guitars are designed to accepted these humongous very tone-full blocks.These sustain blocks are made for Rock! 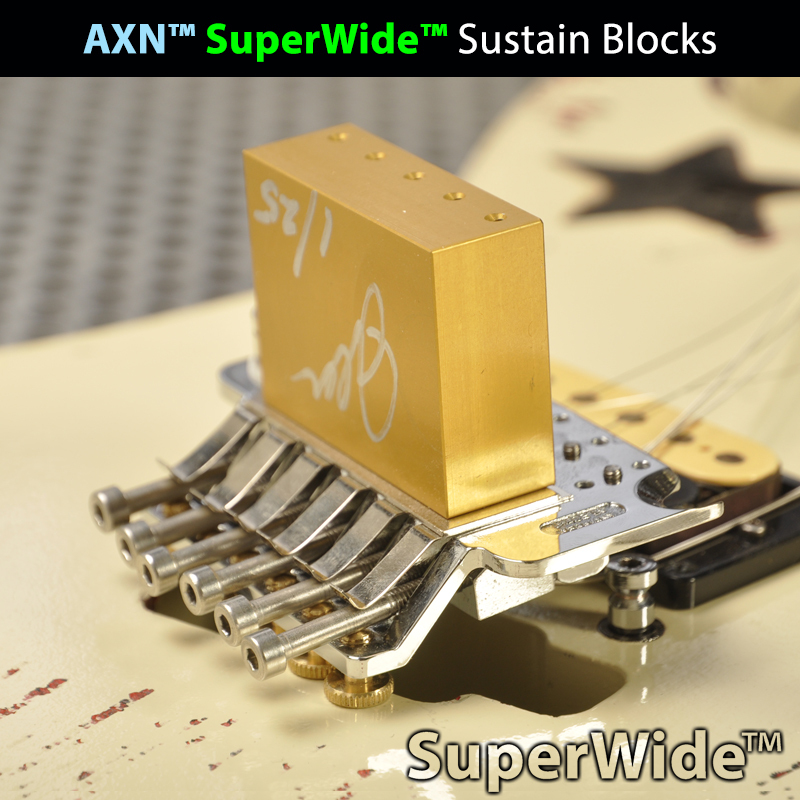 AXN™ Disruptor Sustain Blocks are much thicker. 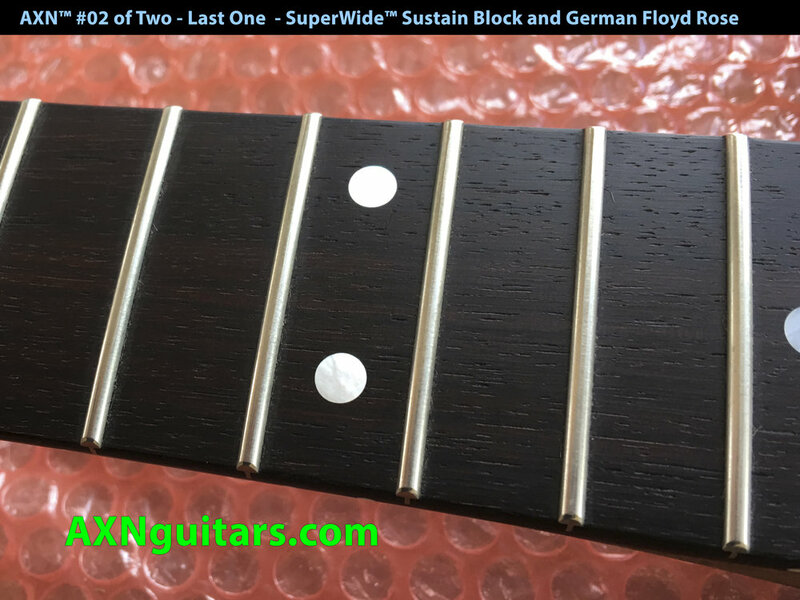 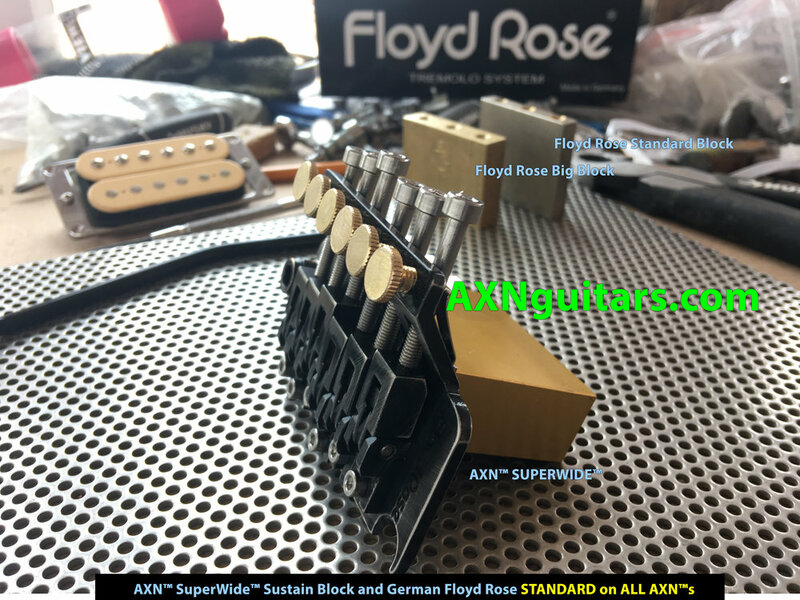 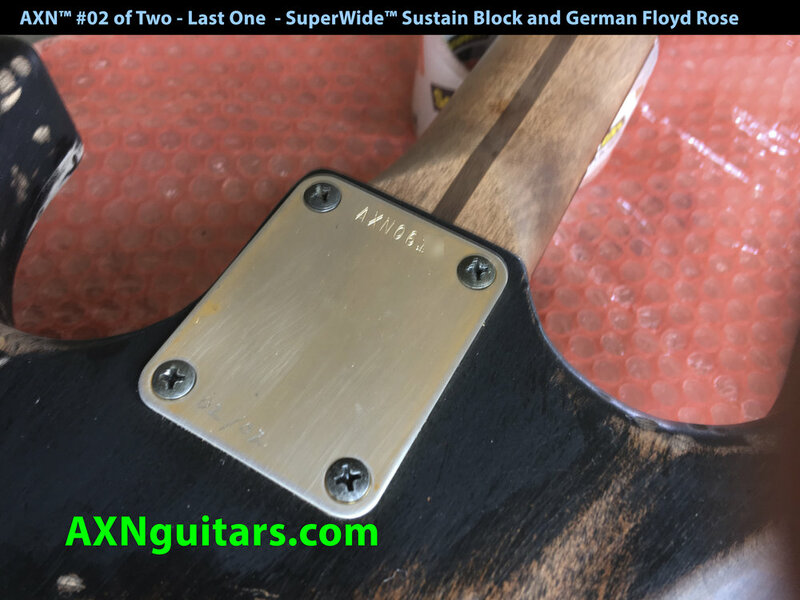 Branded as SuperWide™ The AXN Sustain Blocks we designed for our 2018 line of boutique hand made AXN™Guitars ( http://www.axnguitars.com ) are effectively 5X the size of a stock Floyd Rose blocks. 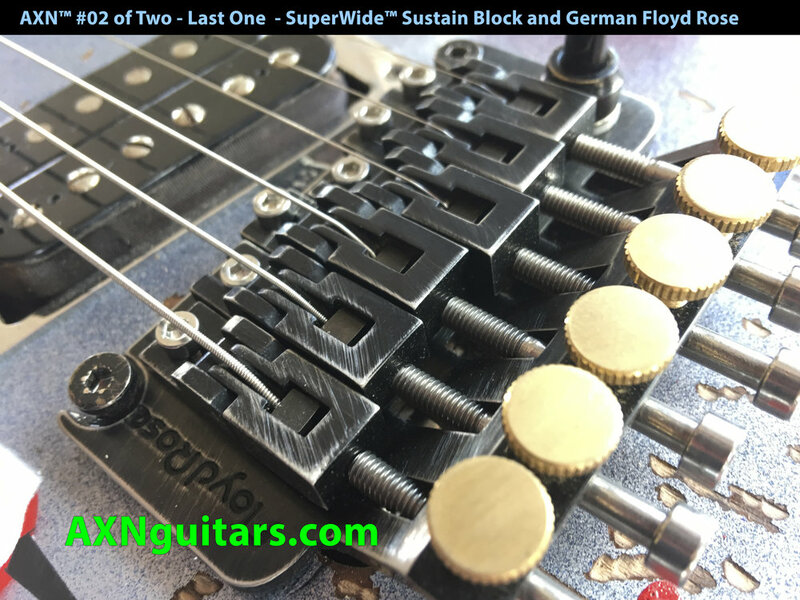 Thay are 3X-4X as Large as an upgrade fat Big Block Floyd Rose brass sustain block. 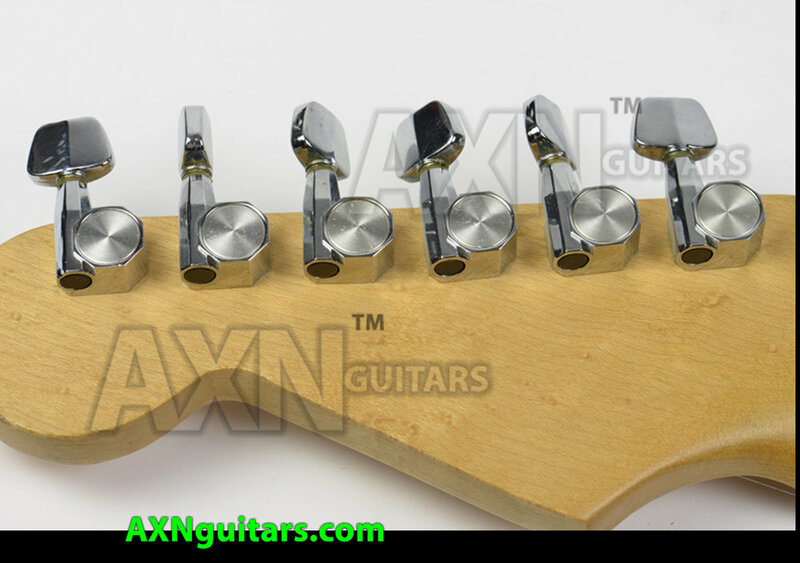 They are the perfect design incorporating the perfect specifications, weight and dimensions for the ultimate whammy experience. 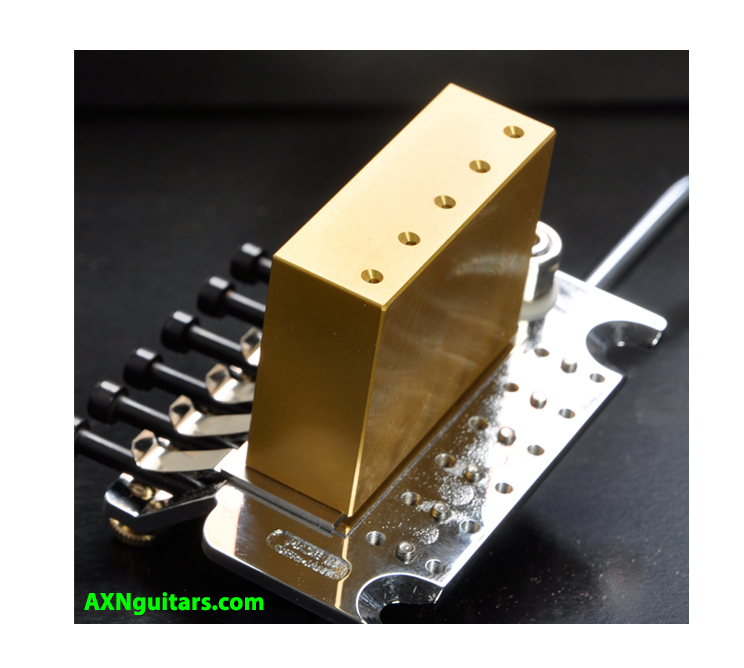 No matter what other manufacturers say a fatter, thicker, machined metal AXN™ BIG block equals out to more frequency control than those "cast" thin metal blocks. 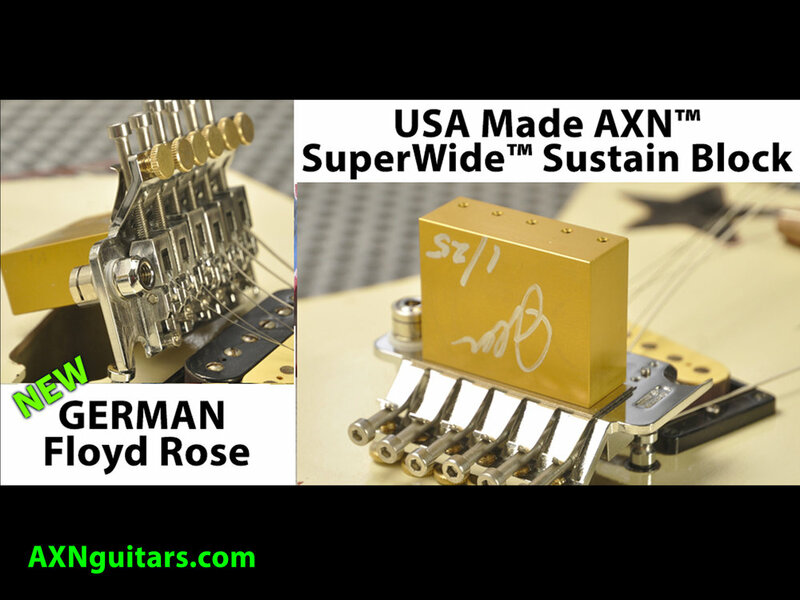 ALL the other sustain blocks are rubbish made in China from poor quality import metals.